Tanabe castle (田辺城) is located at a narrow valley at the mouth of Isatsu-gawa river, in the center of western half of Maizuru city. 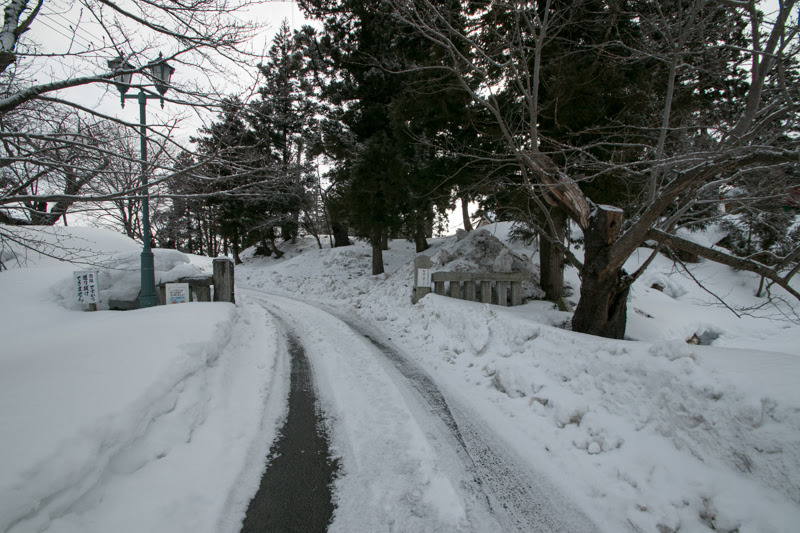 Maizuru city is a part city facing Sea of Japan, at the true north of Kyoto city and worked one of the outer harvors at Sea of Japan side. 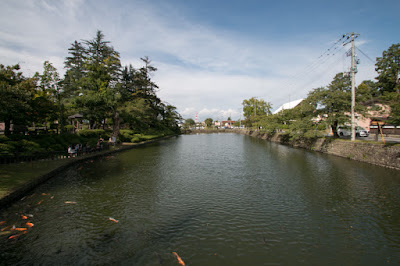 In Edo era, as a trade port Wakasa port or Obama port which could utilize river transportation of Lake Biwako and Yodo river were more prosperous. 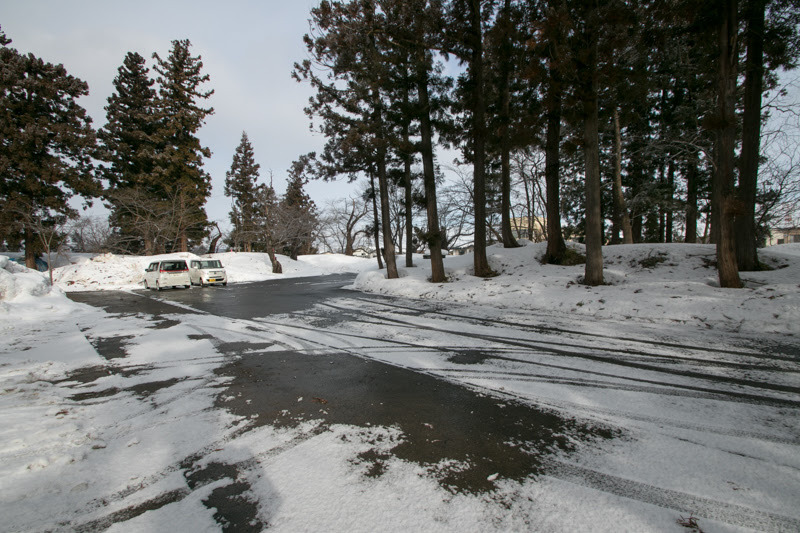 But Maizuru port is a reverse Y letter shape inside narrow straight then had a safe harvor, then it was suitable for anchorage. 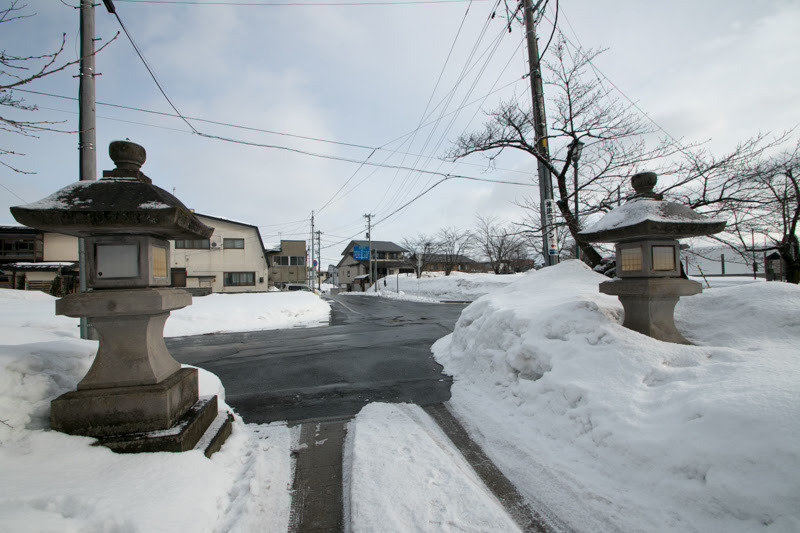 In modern era, along with the development of land transportation, utilizing this shape as a guard from external attack, Maizuru port prospered as both of commercial and military port. 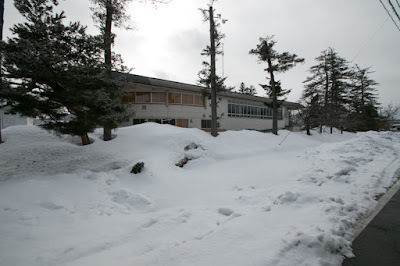 In Muromachi era, Tango province (north part of Kyoto prefecture) was managed by Isshiki clan. Isshiki clan was a relative of Ahikaga clan which established Muromachi Shogunate, and Isshiki clan became a high class retainer of Shogunate and was appointed as the governor of several provinces. 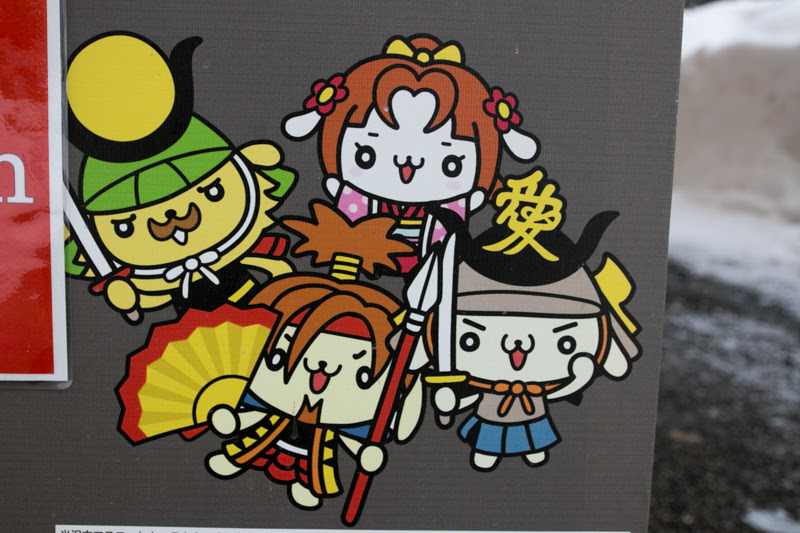 But because of the rise of deputy governor or conflict with other lords, Isshiki clan lost provinces other than Tango province then only survived at this province. Isshiki clan built their residence at the place of current Tanabe castle, and also emergency fortress on Tatebayama mountain at the backside of the residence. In the former half of 16th century, Yoshiyuki Isshiki (?-?) once stroke back the invasion of Takeda clan which was the governor of Wakasa province (western part of Fukui prefecture) then restored Isshiki clan and stabilized the situation of Tango province. But Tango province was a small province with small population and being surrounded by strong warlords, Isshiki clan could not grew their power and expend territory to surrounding provinces. At the time of Yoshimichi Isshiki (?-1579), son of Yoshiyuki, Issiki clan was attacked by large army Mitsuhide Akechi (1528-1582) and Fujitaka Hosokawa (1534-1610), generals of central ruler Nobunaga Oda (1534-1582). Yoshimichi died in the battle and his son Yoshisada Isshiki (?-1582) continued resistance, then Yoshimichi and Fujigaka once made peace and divided Tango province. But later Yoshisada was assassinated by Fujitaka under the confusion at the time of incident of Honnoji, and Hosokawa clan grasped whole Tango province. 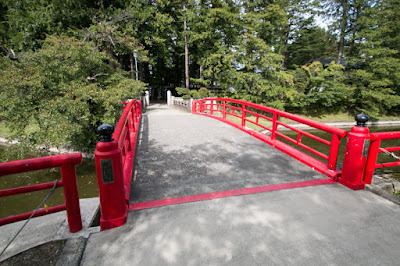 Fujitaka was born at a branch family of Hosokawa clan, one of the highest class retainer of Muromachi Shogunate. 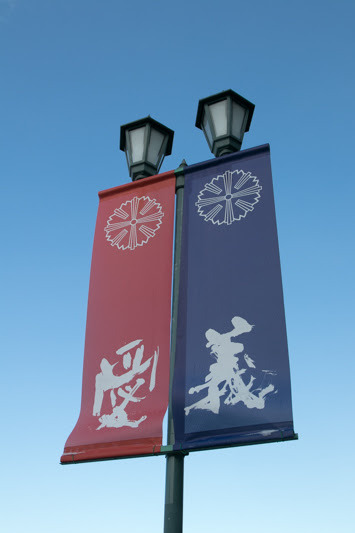 In the middle of 15th century, Hosokawa clan held several provinces of Kinki region, the main territory of Muromachi Shogunate, and became the strongest retainer of Shogunate. Hosokawa clan became the leader of the battle of Onin (1467-1477), and once seized the power of Shogunate. But because of continuous internal conflict and uprising of their retainer Miyoshi clan, the authority and power of Hosokawa clan was almost lost. Fujitaka who was good at culture and courtesy served as a close retainer of Yoshiteru Ashikaga (1536-1565), the 13th Shogun of Muromachi Shogunate. 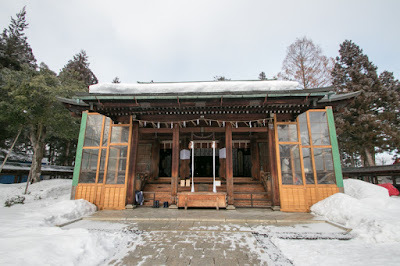 But among the confusing sitnation, Yoshiteru who conflicted with strong retainers such as Miyoshi clan and Matsunaga clan was at last assassinated at his residence in 1565. Rebel army also tried to kill the relative of Yoshiteru, but Fujitaka showed his braveness unlike high class noble and assisted Yoshiaki Ashikaga (1537-1597), the younger brother of Yoshiteru and who lived as a monk, to escape from the assassins. 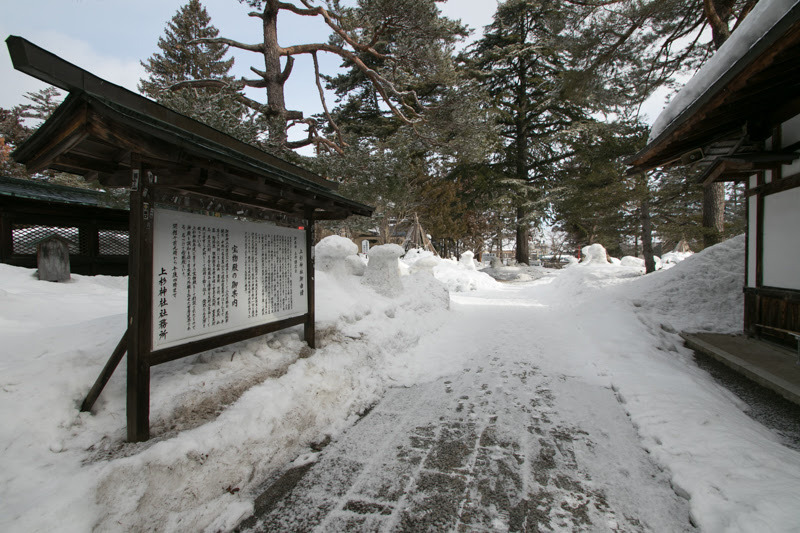 Yoshiaki and Fujitaka wandered several warlords and once stayed at Asakura clan, a strong warlord of Echizen province (Fukui prefecture). Yoshiaki asked Asakura clan to raise an army against Miyoshi clan and Ashikaga clan, but Ashikaga clan entertained Yoshiaki but did not take action. 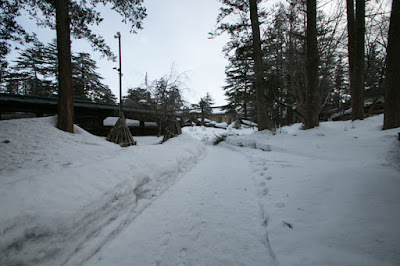 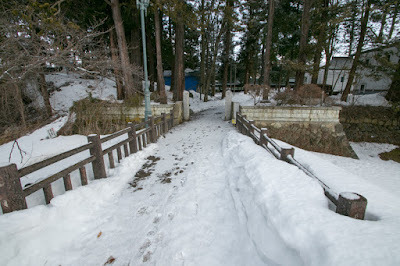 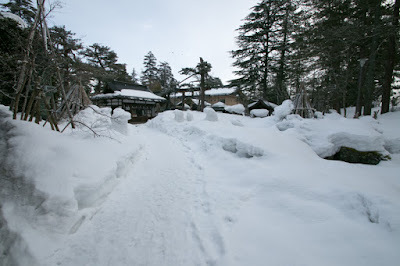 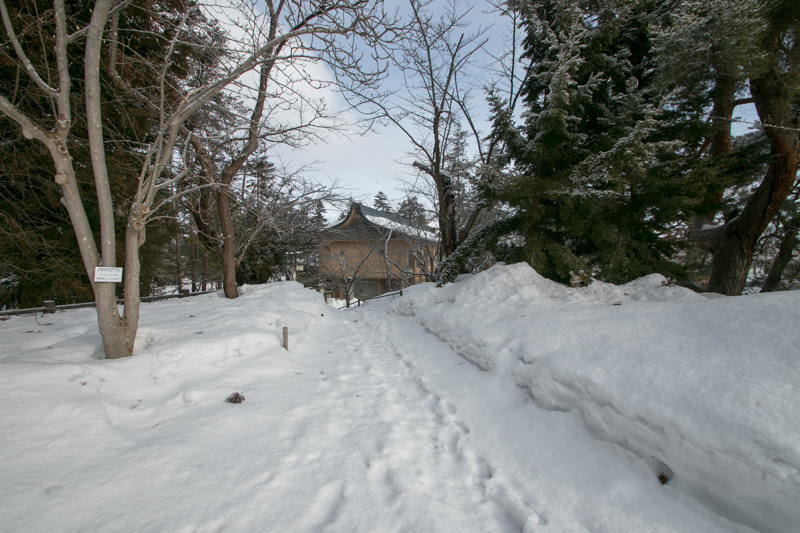 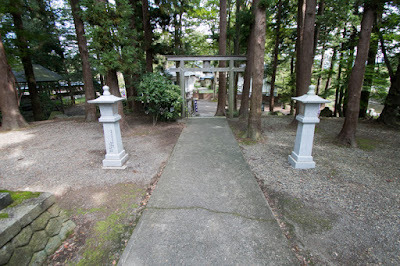 During this stay at Ashikaga clan, Yoshiaki and Fujitaka got to know Mitsuhide Akechi (1528-1582), a person of Toki clan which was a traditional retainer of Shogunate at Mino province (Gifu prefecture) but also wandered after the ruin of his house. Through Mitsuhide, Yoshiaki could get the support from Nobunaga Oda (1534-1582), a warlord of Owari province (western half of Aichi prefecture) who recently seized Mino province and north half of Ise province (Mie prefecture). In 1568, Nobunaga sent a large army and advanced to Kyoto city defeating Rokkaku clan or Miyoshi clan, then placed Yoshiaki as a 15th Shogun of Shogunate. 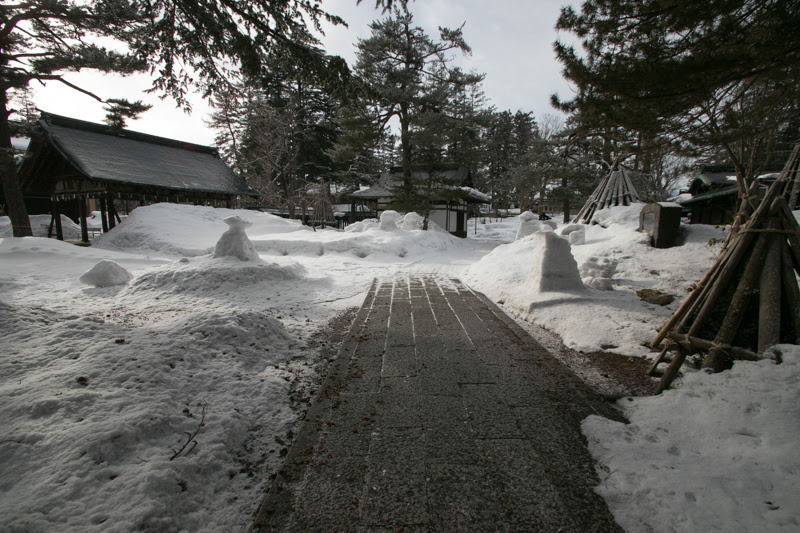 Fujitaka and Mitsuhide became the close retainer of Yoshiaki, but Mitsuhide was also a general of Nobunaga. 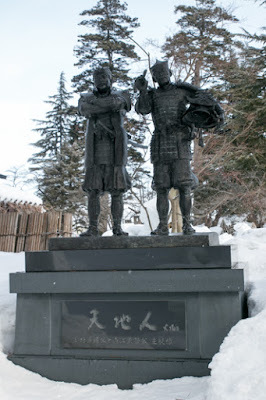 At first the relationship between Nobunaga and Yoshiaki was good, but gradually the difference of Yoshiaki who tried to strengthen the authority of Shogunate and Nobunaga who hoped to exercise his power emerged. 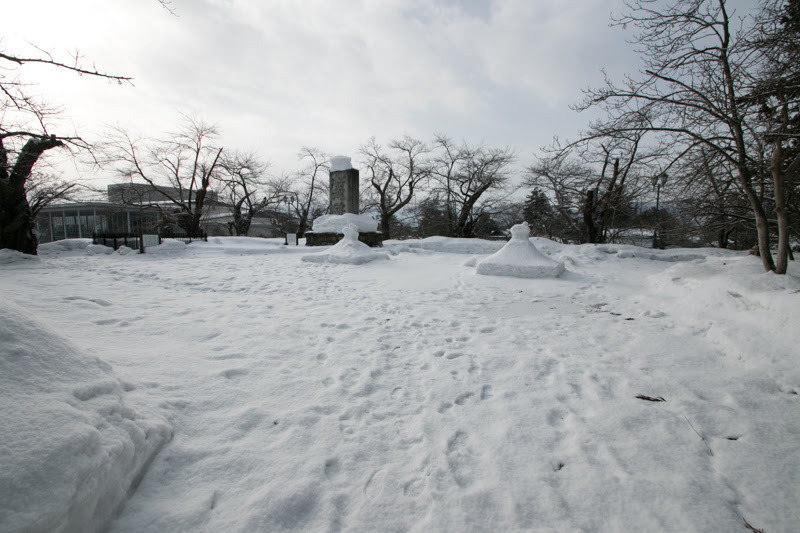 Yoshiaki urged surrounding warlord to ally and defeat Nobunaga, but Nobunaga survived this severe encirclement. 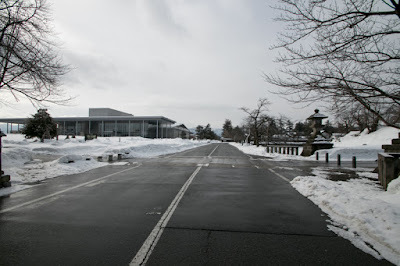 In 1573, Fujitaka left Yoshiaki and served to Nobunaga, and finally Nobunaga expelled Yoshiaki from Kyoto city and substantially ruined Muromachi Shogunate. 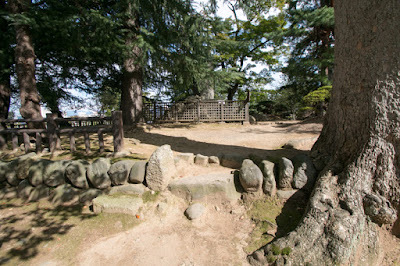 Fujitaka became a supporting general of Mitsuhide and became the lord of Shoryuji castle. 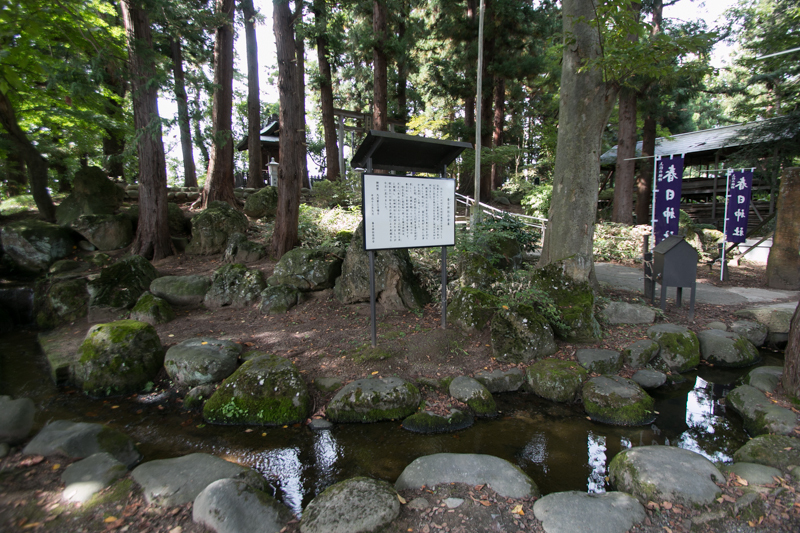 As Mitsuhide became the commander of Tanba province (northwest part of Kyoto prefecture), Fujitaka fought at the north part of Kyoto city. In 1580, Fujitaka attacked Isshiki clan which held Tango province, and after hard battle Hosokawa clan captured south half of Tango province as their territory. As north part of the province was still held by Isshiki clan, Fujitaka newly built Miyazu castle at northwest from Maizuru area and used as a residence but Tanabe castle was still used as an important base. 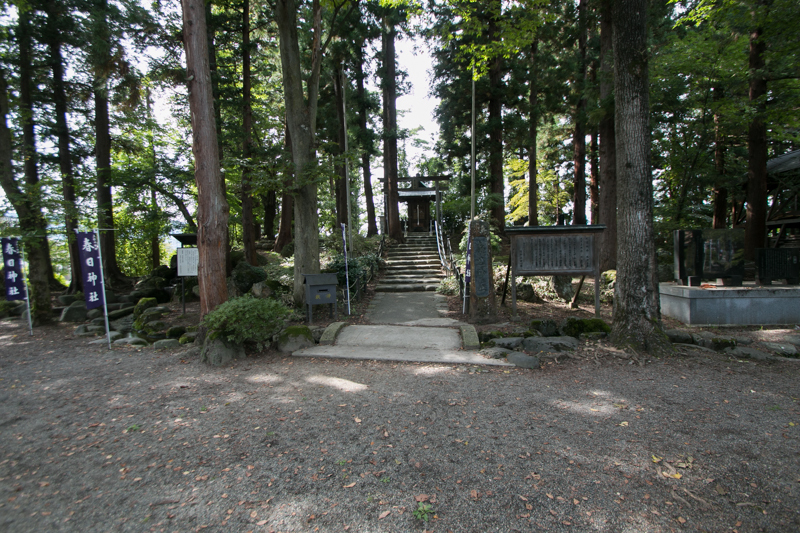 Fujitaka also let his son Tadaoki Hosokawa (1563-1646) marry with Tama (1563-1600, known as her Christian name Garasha), a daughter of Mitsuhide. 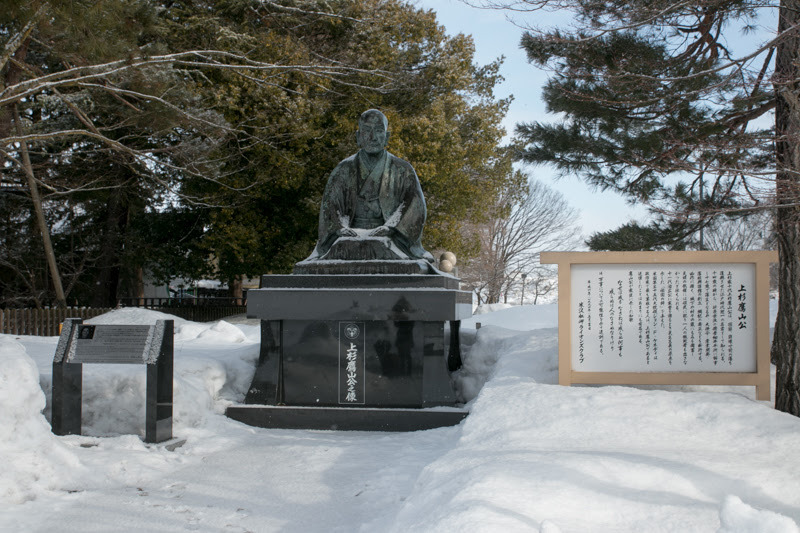 But in June 1582, Mitsuhide suddenly made a coup d’etat against Nobunaga and forced him to suicide in the accident of Honnoji. Mitsuhide expected Fujitaka and Tadaoki to support him, but looking at the approach of Hideyoshi Hashiba (1537-1598, later Hideyoshi Toyotomi) who was another regional commander of Nobunaga with large army, Hosokawa clan was asked from Mitsuhide to support him. 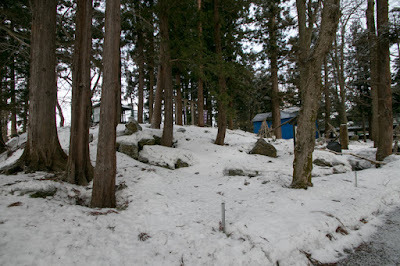 But Fujitaka and Tadaoki kept neutral and confined Tama. 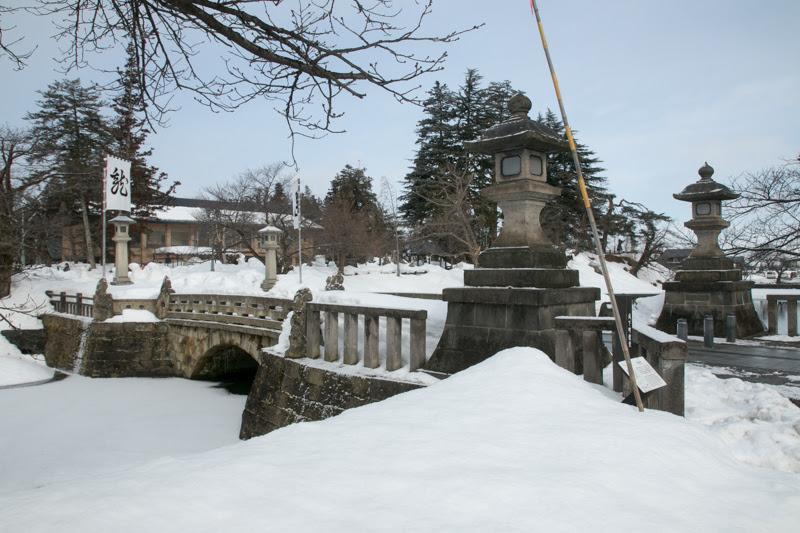 Mitsuhide could not get assistance of attached lords had to fought against Hashiba army with less soldiers, then was defeated at the battle of Yamazaki. 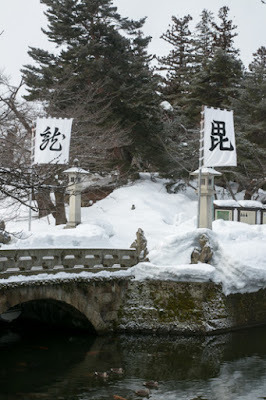 The hegemony of Mitsuhide ended in 10 days and Hideyoshi became the next ruler. 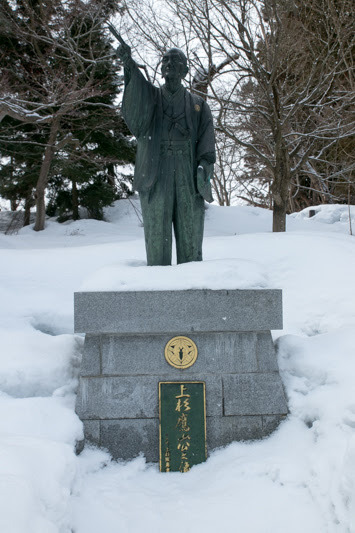 After the cease of battle, Fujitaka retired and succeeded leader position to Tadaoki. 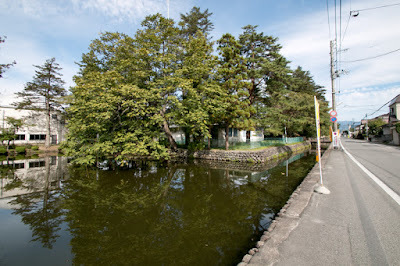 Hosokawa clan ruined remaining Isshiki clan and seized whole Tango province, then Tadaoki lived at Tanabe castle as a main base and Fujitaka moved to Miyazu castle as a retirement place. 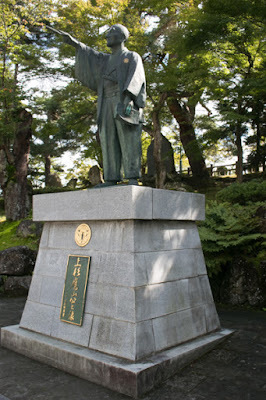 Utilizing his cultural knowledge on Japanese tea celemony or Japanese poem, Fujitaka became a cultural figure under Toyotomi government and served to Hideyoshi. 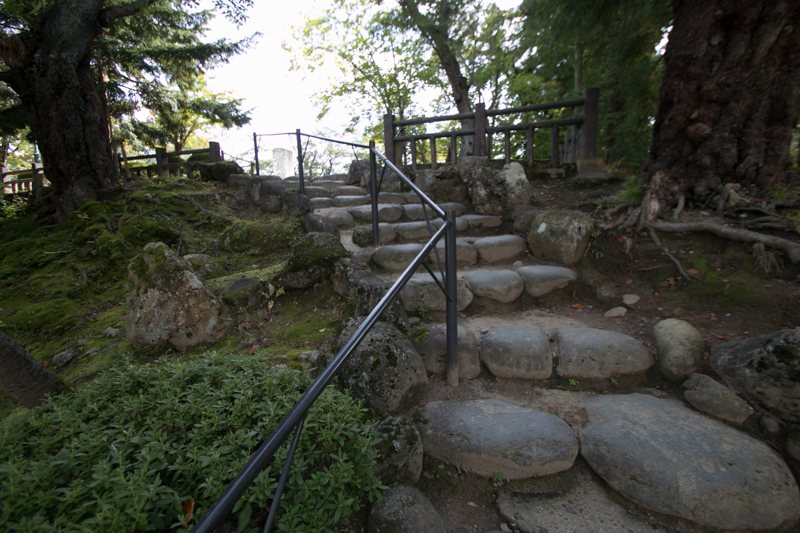 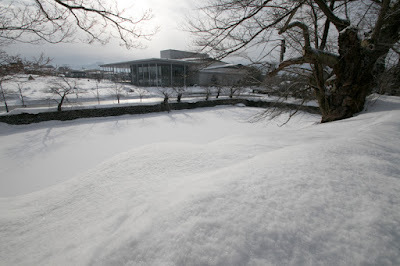 At the same time, as a lord of Tango province, Tadaoki renovated Tanabe castle into a modern one. 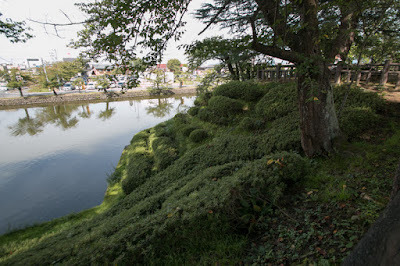 Tanabe castle is built at a narrow valley between two hills and rivers, and it shape is strongly affected by the terrain. 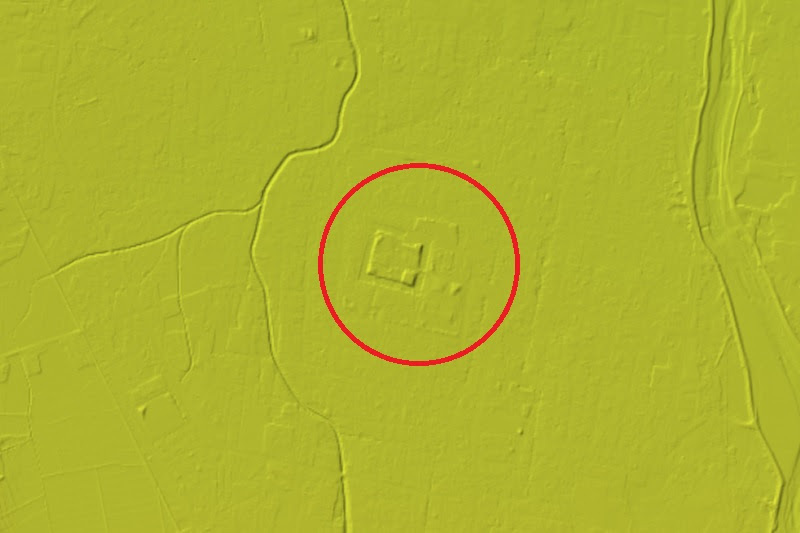 As it was impossible to use wide space, rough shape of the castle is a spiral one to keep the distance between front gate and central area. Central area of the castle is L shaped area of 100 meter long and 50 meter width, and at the middle of vertical line there is 20 meter long square basement of main tower. 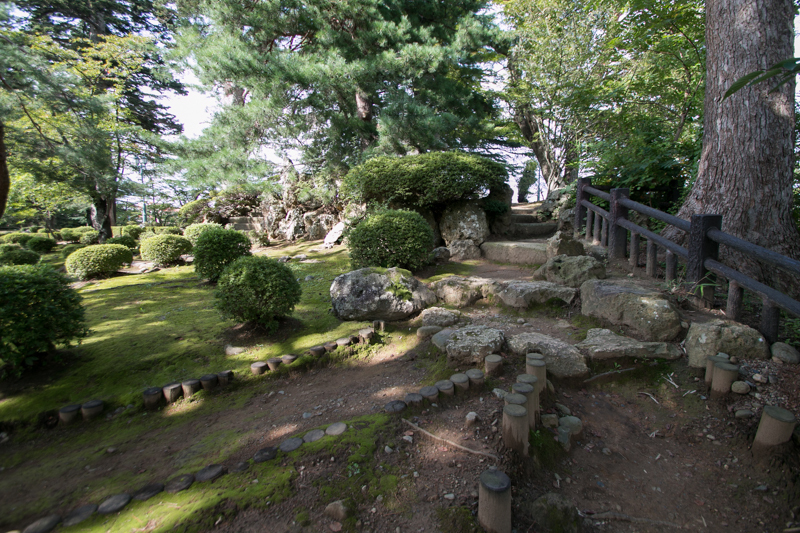 This main tower basement was built at the time of Hosokawa clan in Nozurazumi style, an old generation stone wall method built by mixture of large rough stones and small pieces filled at the gap. At first main tower basement was plunged into water moat like an island, but later was connected to the central area by its expansion. 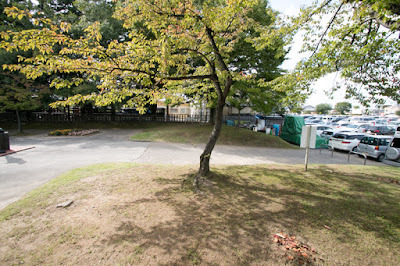 A three story main tower was built over this basement. 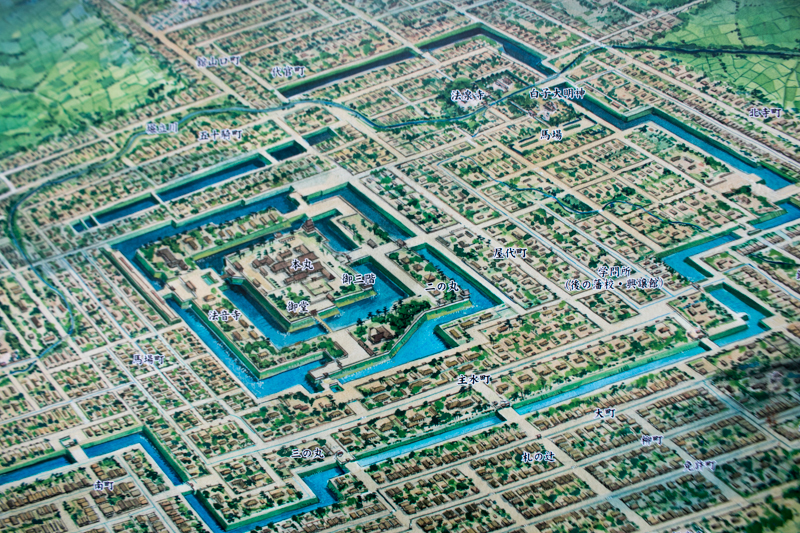 Secondary area is C shaped area of 200 meter long and 100 meter wide outside of central area, and third area might be added later is a “b”letter shape area of 600 meter long and 300 meter wide surrounding secondary area. 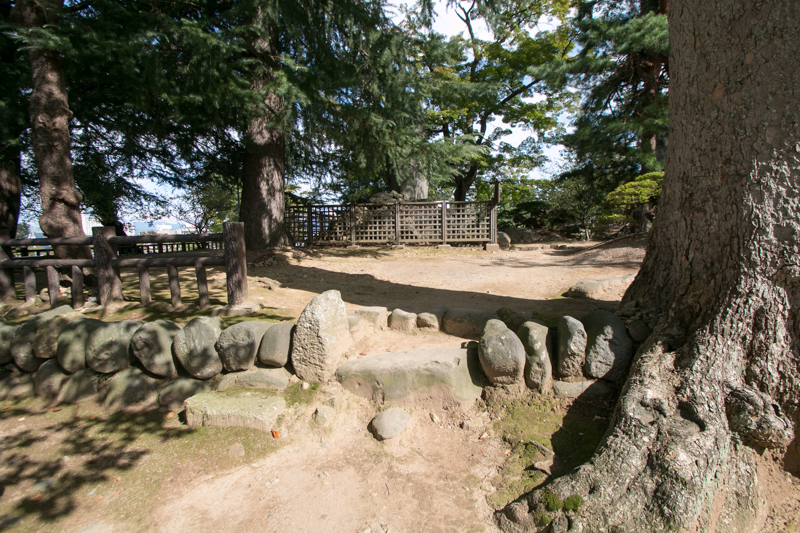 As it was impossible to build tall stone wall on weak ground, the line of stone walls were complexly folded to prevent climbing of enemies. 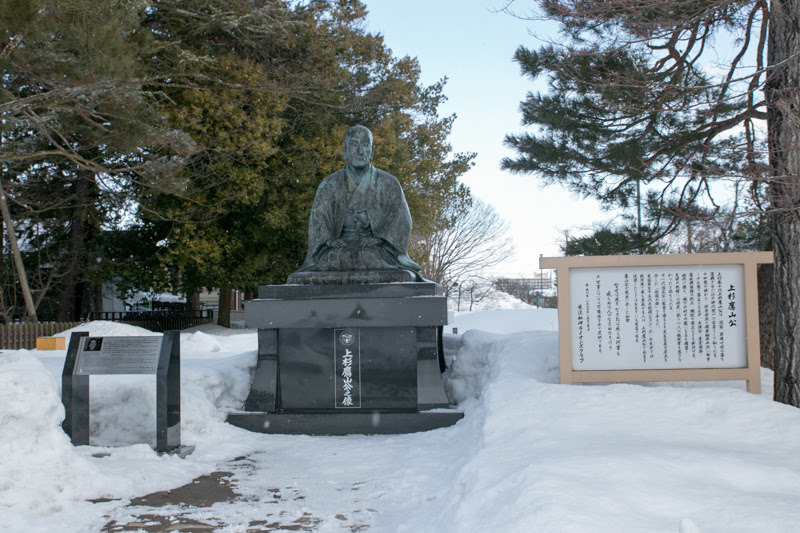 After the death of Hideyoshi, a struggle between Ieyasu Tokugawa (1543-1616) and Mitsunari Ishida (1560-1600) for next hegemony occurred. As Tadaoki Hosokawa was on bad term with Mitsunari in the conflict between front general and backside administrative staff, Tadaoki became the leader of anti Mitsunari group. 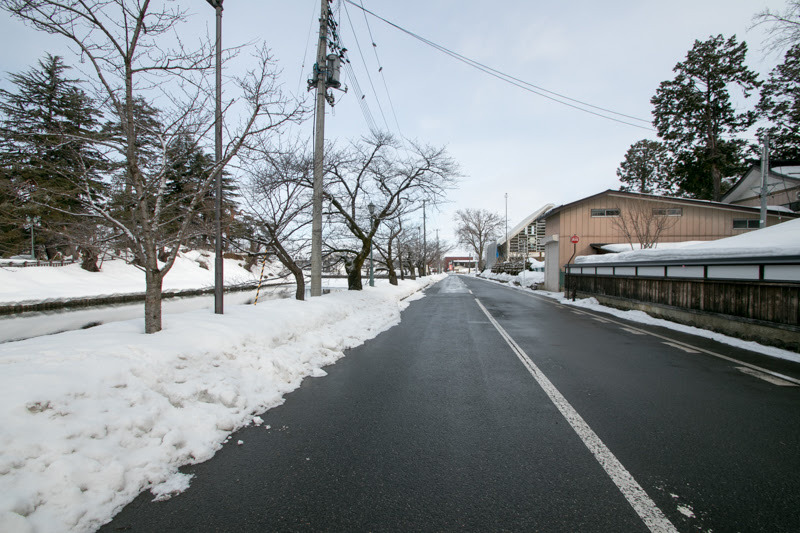 In June 1600, Tadaoki followed Ieyasu who marched to Tohoku region, but looking at the absence of Ieyasu, Mitsunari raised his army. Mitsunari confined families of opposing lords who were kept as a hostage to Toyotomi government and lived near Fushimi city, but Tama let her killed by retainer to avoid to be a hostage and effect to the decision of the clan. 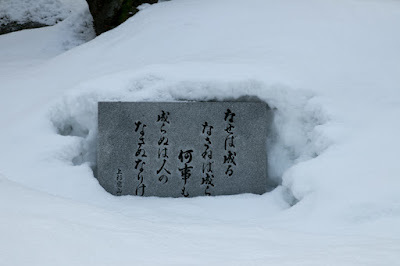 Mitsunari lost reputation and stopped this policy, but Hosokawa clan and Mitsunari became a mortal enemy. Next, Mitsunari sent a large force to Tango province, to secure Kinki region as their main base. 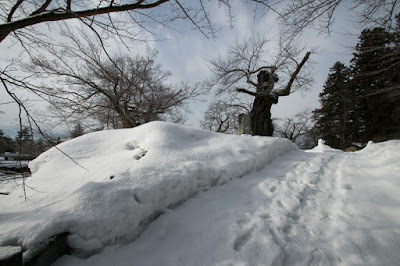 As Tadaoki lead most force of Hosokawa clan to the expedition of Ieyasu, only 500 defenders remained in the territory. 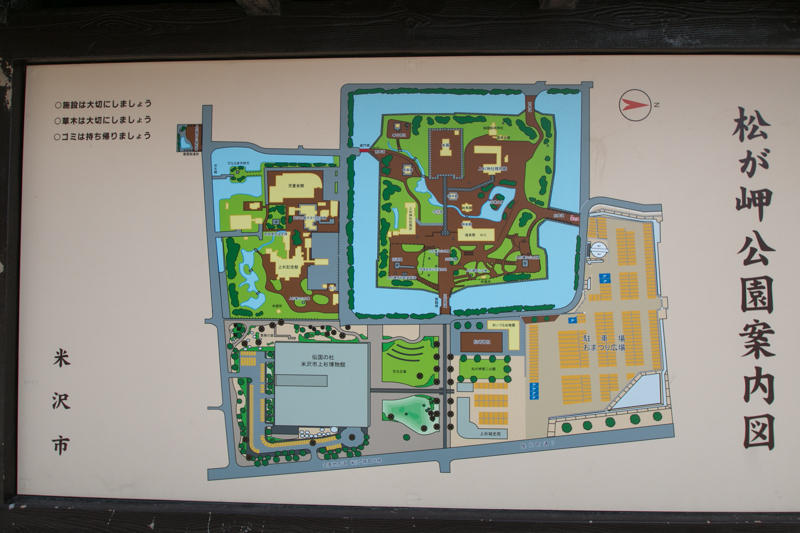 Fujitaka moved to Tanabe castle and prepared for besiege. 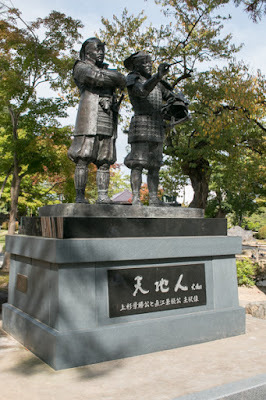 In July 1600, 15,000 soldiers of Ishida side lead by Shigekatsu Onogi (1563-1600) who was the commander of Fukuchiyama castle encircled Tanabe castle. Tanabe castle was protected by layers reviews and water moats at narrow valley, and might be able to resist direct attack from same level. But as it was surrounded by hills, it was easy to shot by cannons. 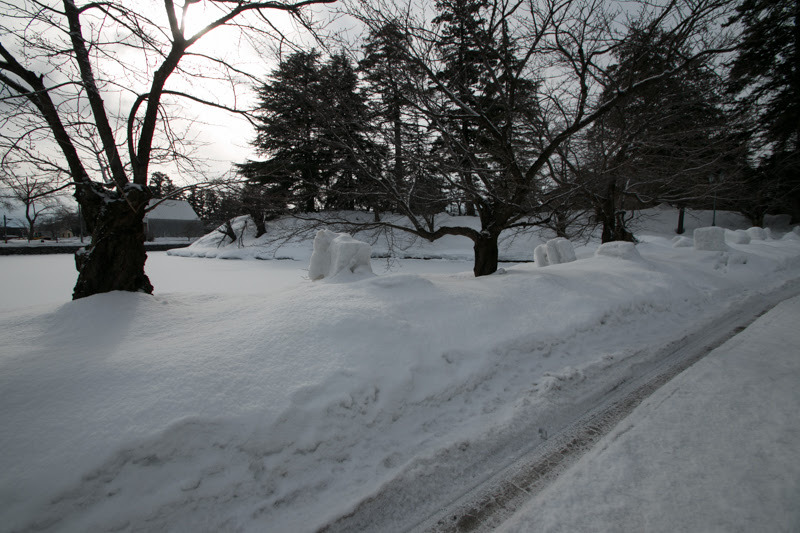 Along with limited number of guarders, the castle side fell into severe situation immediately. 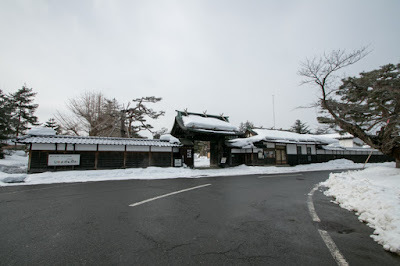 Fujitaka had to be ready to the fall of Tanabe castle and his death, but an unexpected intervention came to Tanabe castle from Emperor Goyozei (1571-1617). 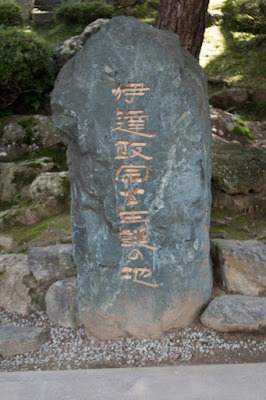 Fujitaka had a qualification of mastery for the interpretation of “Kokin Wakashu”, an old collection of Japanese poems edited in 10th century. As this qualification named "Kokin Denju" was handed from master to only one pupil, then if Fujitaka had died, this mastery might be lost forever. 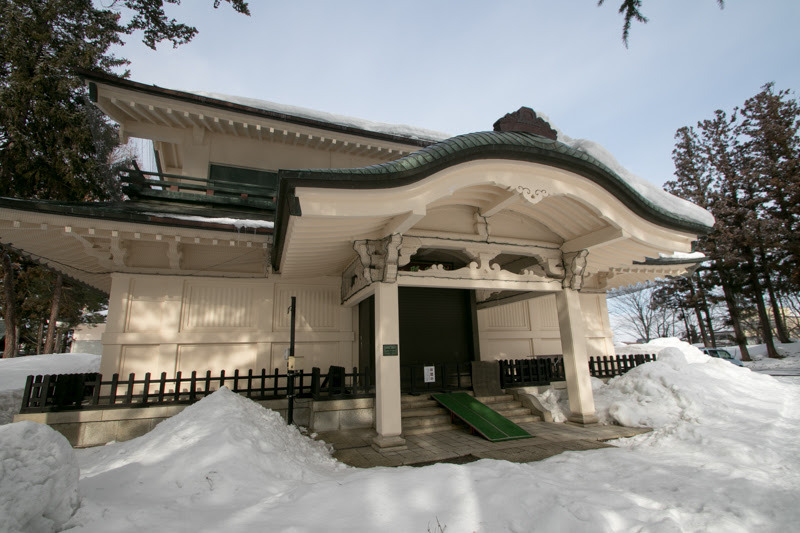 Imperial Household strongly hoped the continuation of this mastery and sent envoy to Tanabe castle and coordinated reconciliation of both parties. Dominant Ishida army knew this situation held back the attack to avoid bad reputation from Emperor, and finally Fujitaka opened Tanabe castle after 50 days siege and was confined at the beginning of September. But just after the opening of Tanabe castle, the decisive battle of Sekigahara between Tokugawa army and Ishida army occurred at distant Sekigahara at Mino province (Gifu prefecture), and 15,000 soldiers of Ishida army could not participate in this battle. As a result, Tanabe castle stranded many enemies and contributed to the victory of Tokugawa army, along with Otsu castle (Shiga prefecture) also attacked from Ishida army and opened just before the battle. 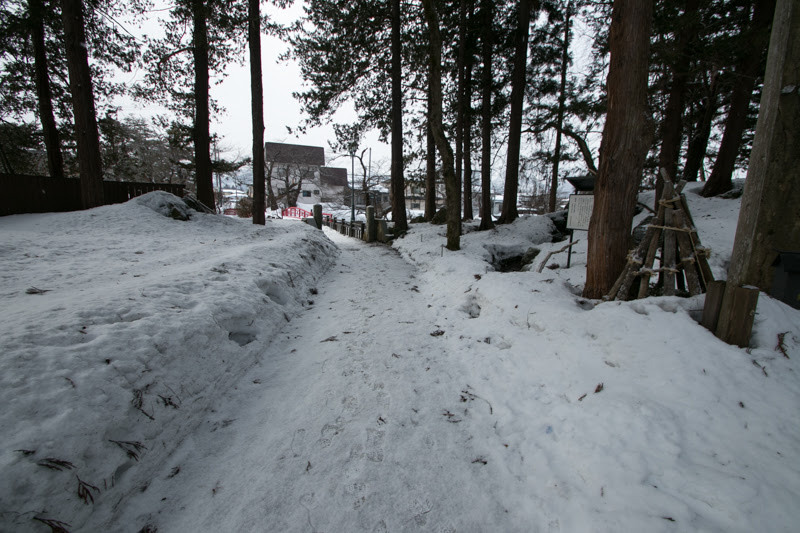 Considering his intelligence and braveness, Fujitala utilized his reputation to the fullest and tricked the enemy. 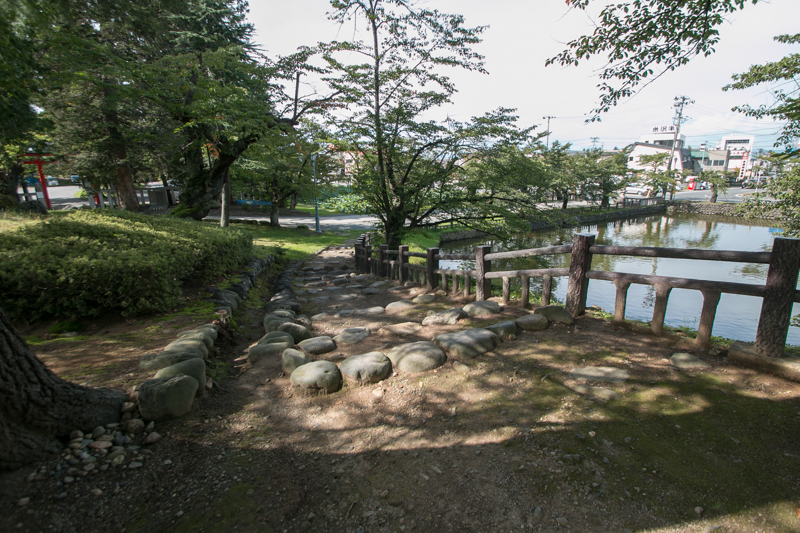 After the battle of Sekigahara, being significantly evaluated loss of wife and binding of enemy, Hosokawa clan promoted to the large lord of Kokura castle and Nakatsu castle at Buzen province (eastern half of Fukuoka prefecture). 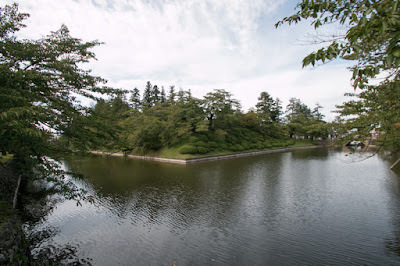 Furthermore, in 1632, Hosokawa clan moved to the lord of Kumamoto castle (Kumamoto prefecture) and became the sixth largest feudal lord in Japan. 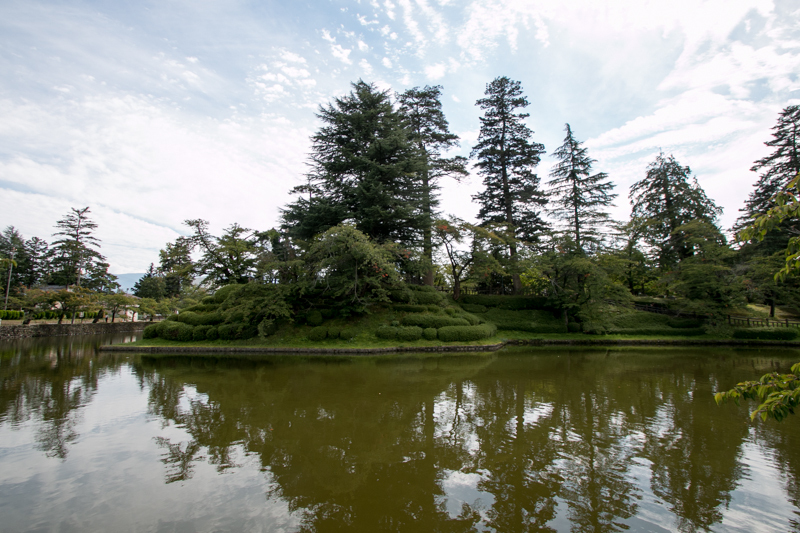 From mere fugitive to large lord, Fujitaka survived the turbulent period by his foreseeability and boldness rarely as a high class noble. Along with the transfer of Hosokawa clan, Tanabe castle was held by Kyogoku clan but they used Miyazu castle as a main base then Tanabe castle was once abolished. Later Kyogoku clan divided their territory into Miyazu domain and Tanabe domain, thus Tanabe castle was restored at this time. 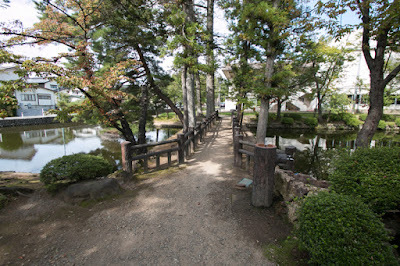 In 1668 Kyogoku clan was transferred to Toyooka castle (Hyogo prefecture), and Makino clan which was the hereditary retainer of Edo Shogunate held Tanabe castle by the end of Edo era. 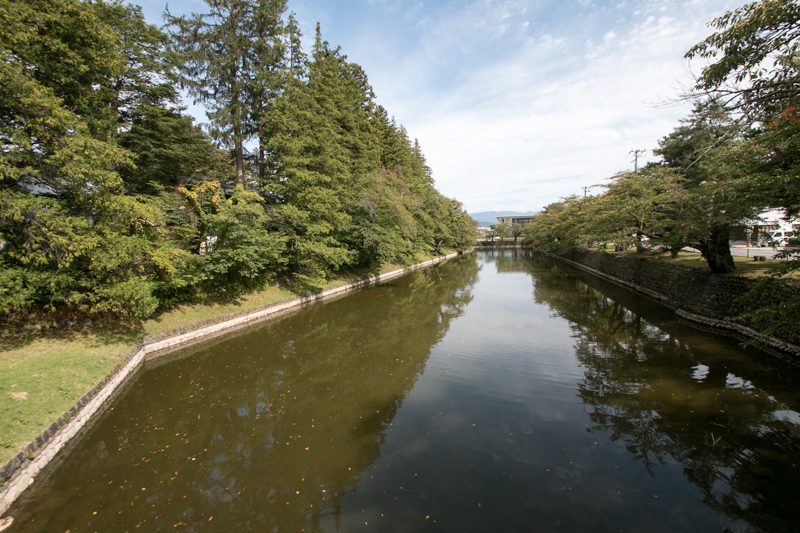 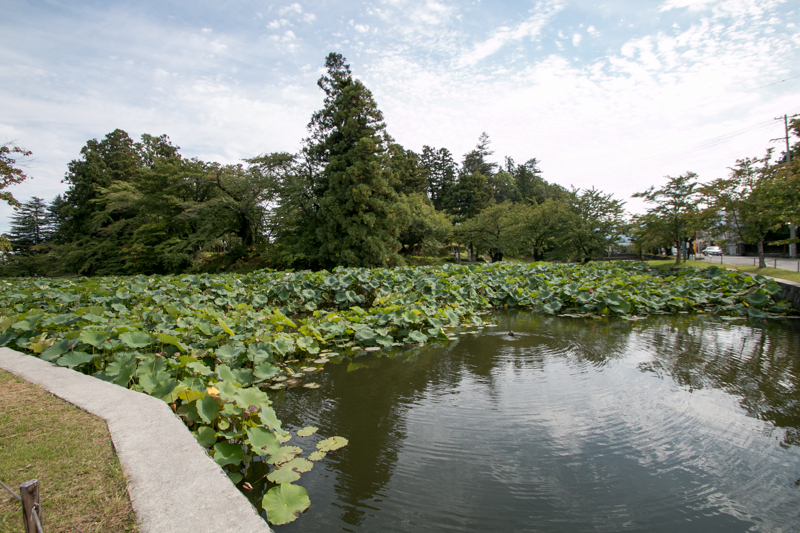 Subsequent to Meiji revolution, all building and water moats were lost and outer area disappeared by development of city. But former central area is kept as a park, and stone walls of central area including main tower basement partially remain. 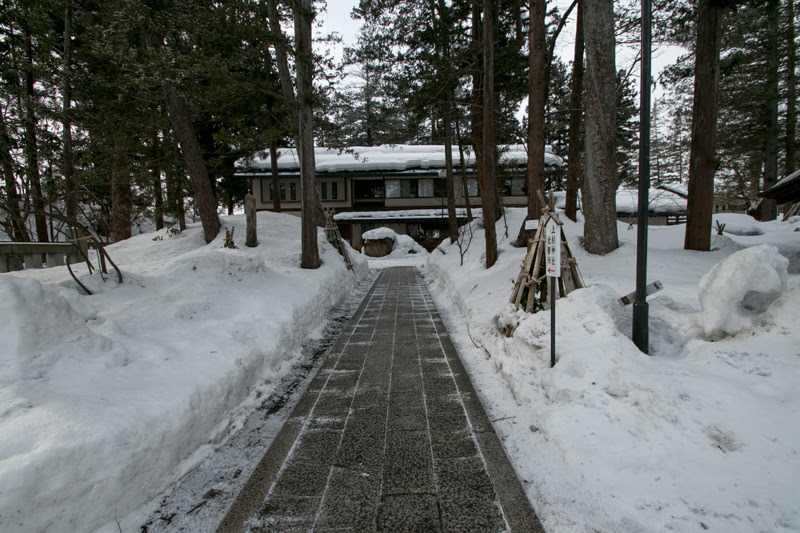 In 1940, a corner turret like building was built at the corner of stone wall, and in 1997 main gate was rebuilt next of corner turret, even though at different place from original.Looking at elegant but low stone walls, it just looks as a residence of cultural figure than a military general. 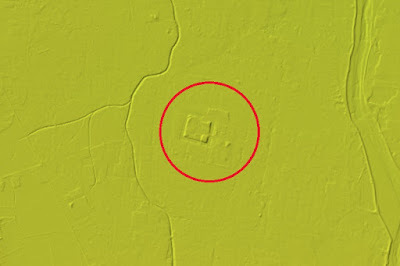 This also reminds us the extraordinary cultural mastery and formidability which let the lord survive under the siege of this small castle. 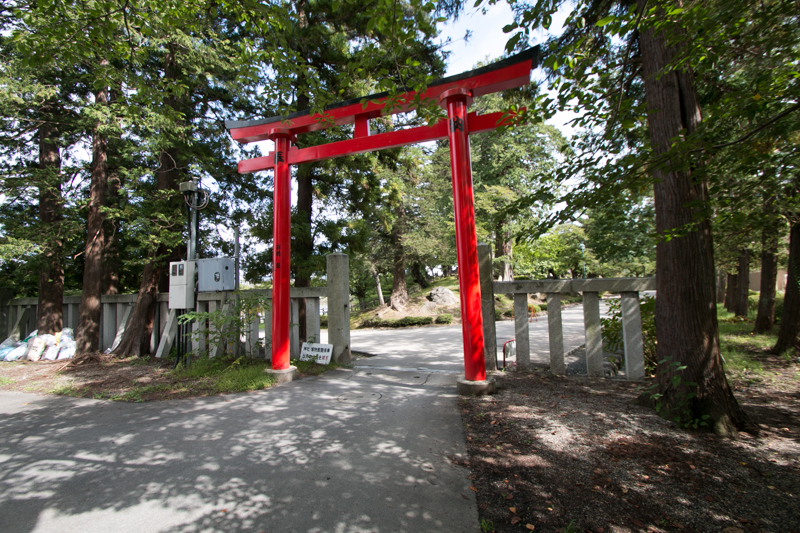 10 minutes walk from JR West Maizuru line Nishi-Maizuru station. 10 minutes drive from Maizuru Wakasa Jidoshado Expressway Maizuru-Nishi interchange. Yonezawa castle (米沢城) is located at the flat land between Mogami-gawa River and Hottate-gawa River, in the center of Yonezawa city at Yonezawa basin. 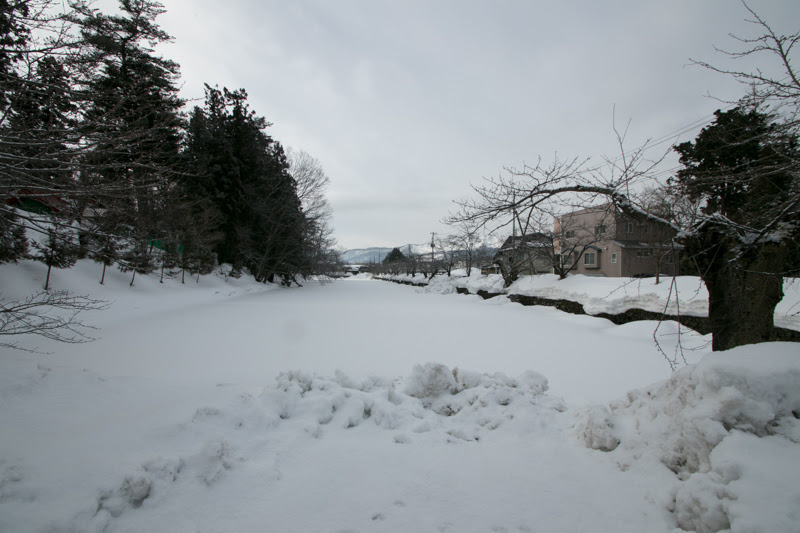 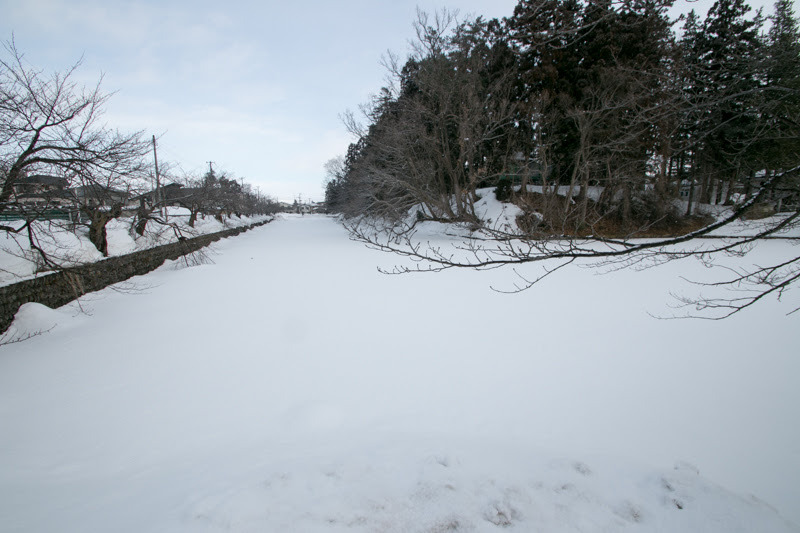 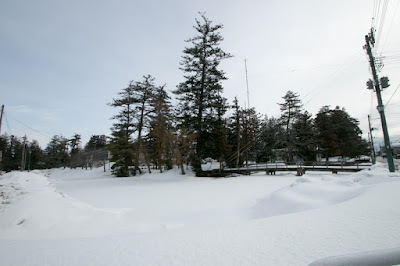 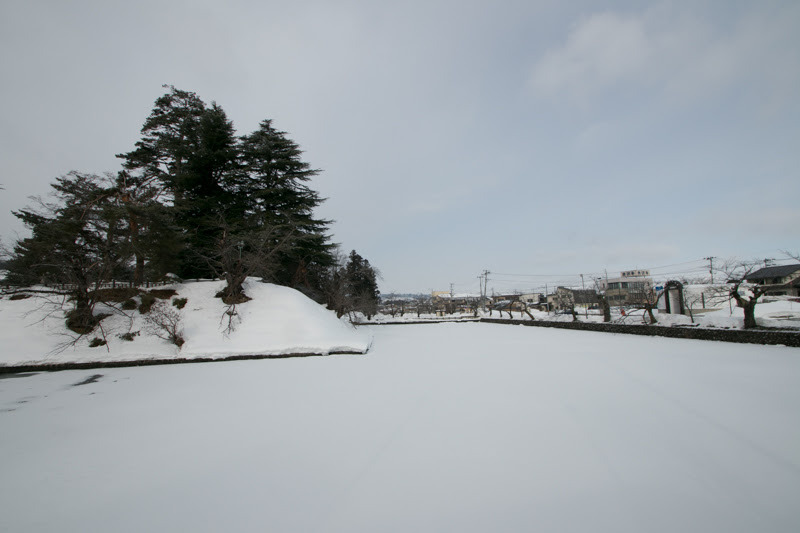 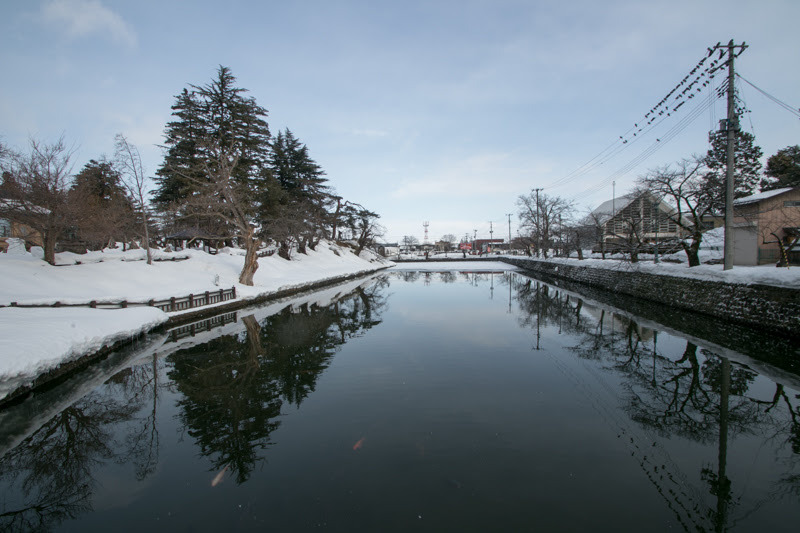 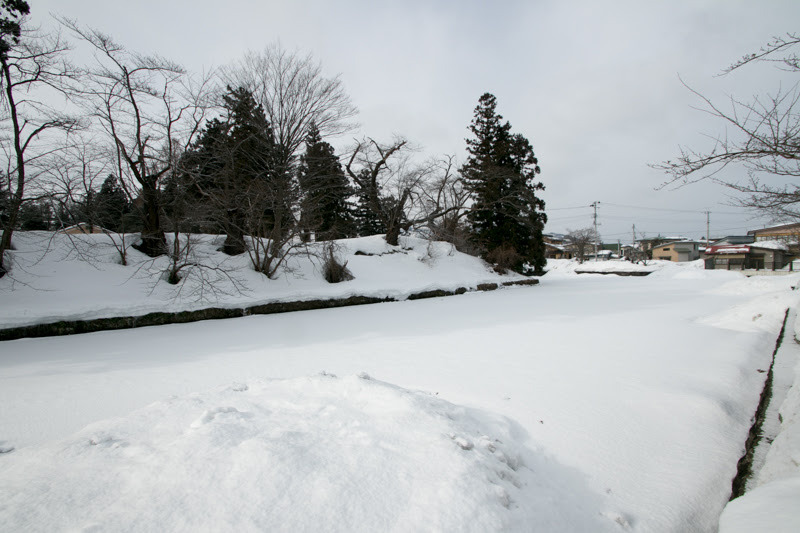 Yonezawa area is the south edge of basins spreads north and south ward along with Mogami-gawa river which runs northward at the middle of Dewa province (Yamagata prefecture). 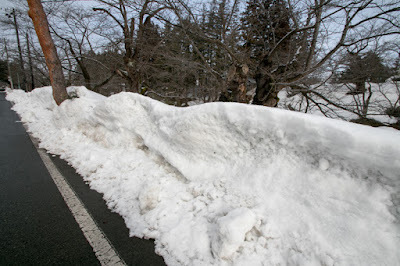 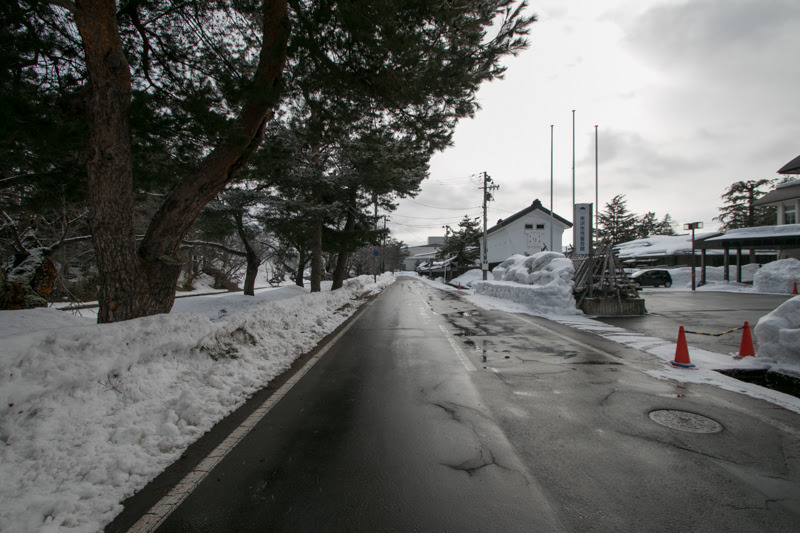 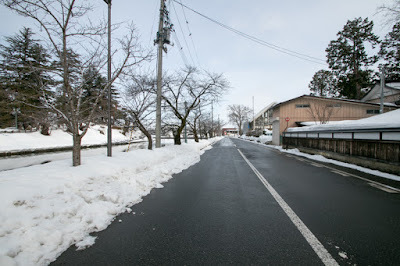 This area is a meeting point of roads from Fukushima area of southeast ward, Aizu Wakamatsu area of southwest ward and Murakami area of westward, and worked as an entrance of western half of north part of Tohoku region from Kanto region through Shirakawa gate and Fukushima area. 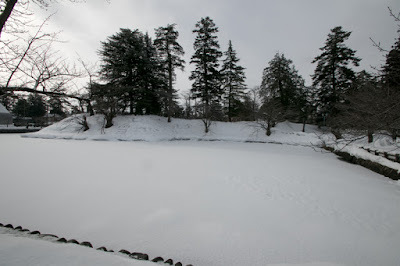 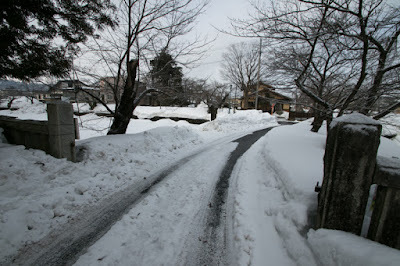 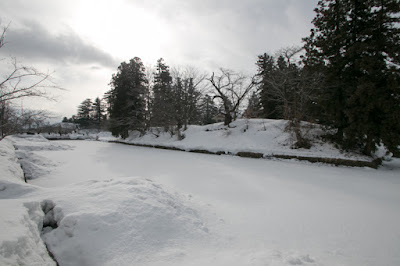 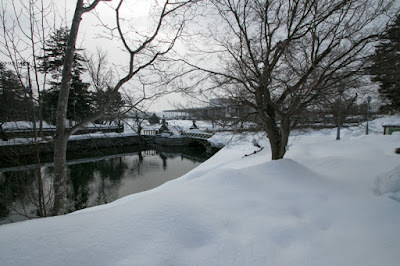 Precise year is unknown but Yonezawa castle is said as a residence of Nagai clan in 13th century. 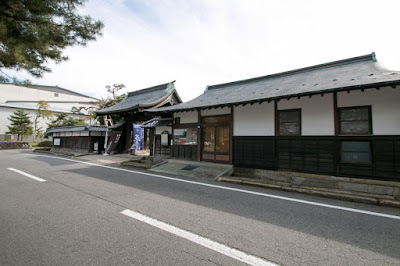 Nagai clan was a descendant of Hiromoto Oe (1148-1225), the first chief secretary of Kamakura Shogunate under Yoritomo Minamoto (1147-1199), the founder of Kamakura Shogunate. Main stream of Oe clan was later involved into political conflict and ruined, but its descendants spread into many areas and became local lord. 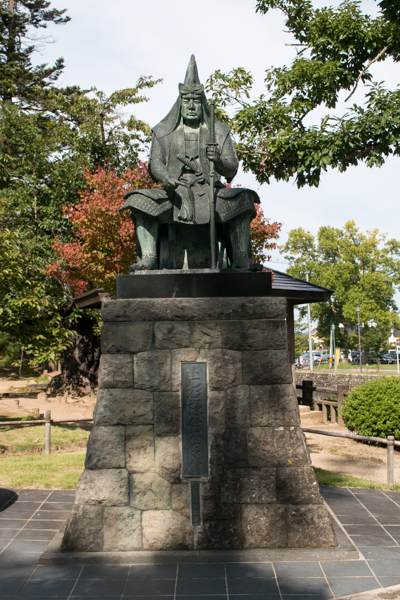 The most famous descendant of Oe clan was Mouri clan, which was the lord of Aki province (western half of Hiroshima prefecture) which grew into the ruler of Chugoku region. 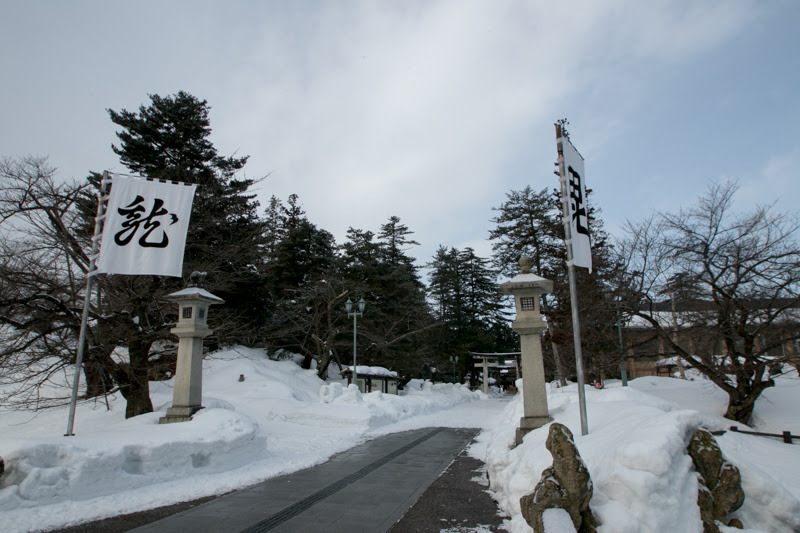 Nagai clan was also a prominent descendant of Oe clan which became a high class retainer of Kamakura Shogunate and was given Yonezawa basin. 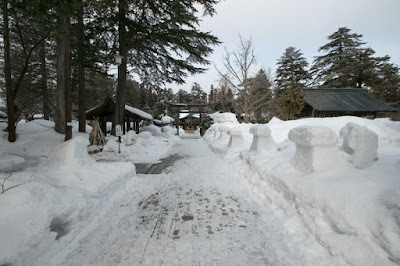 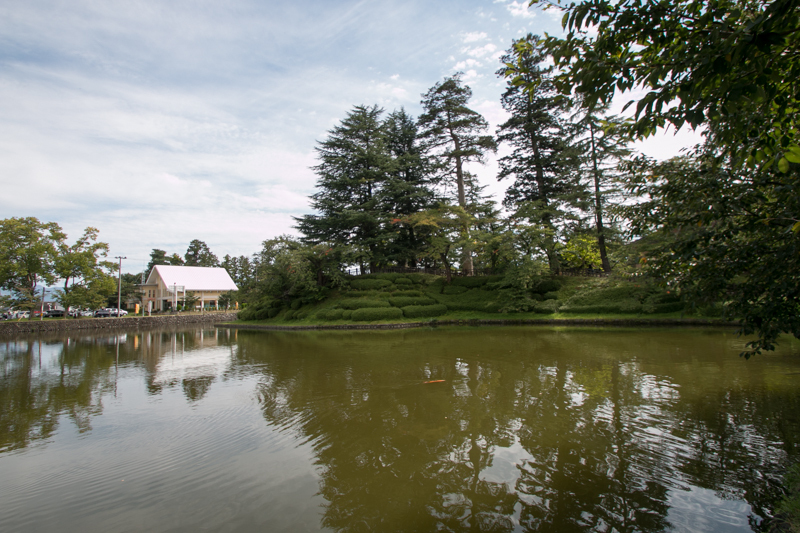 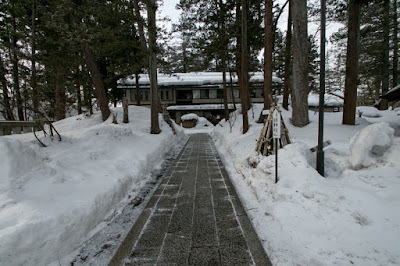 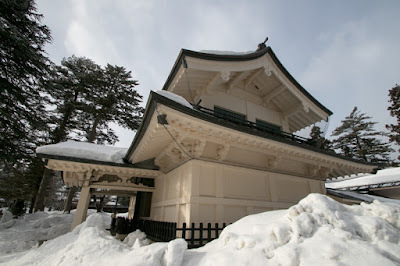 Nagai clan built Yonezawa castle as their residence and managed Yonezawa basin over 150 years. 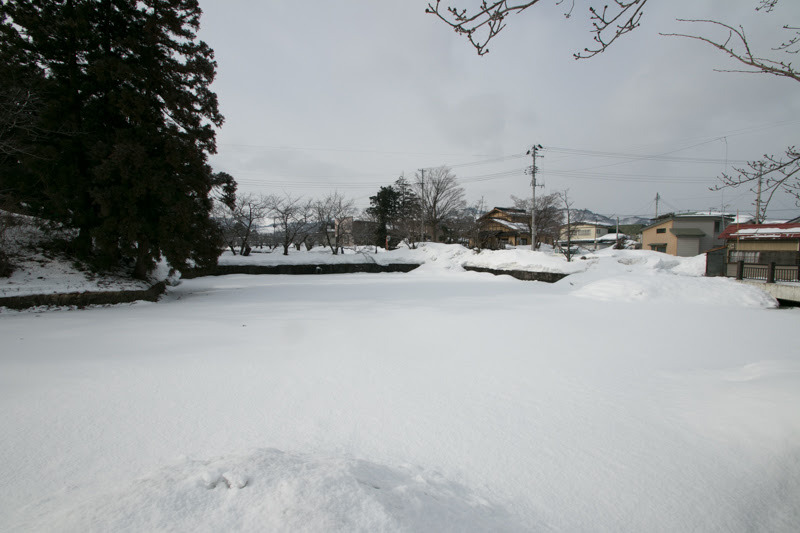 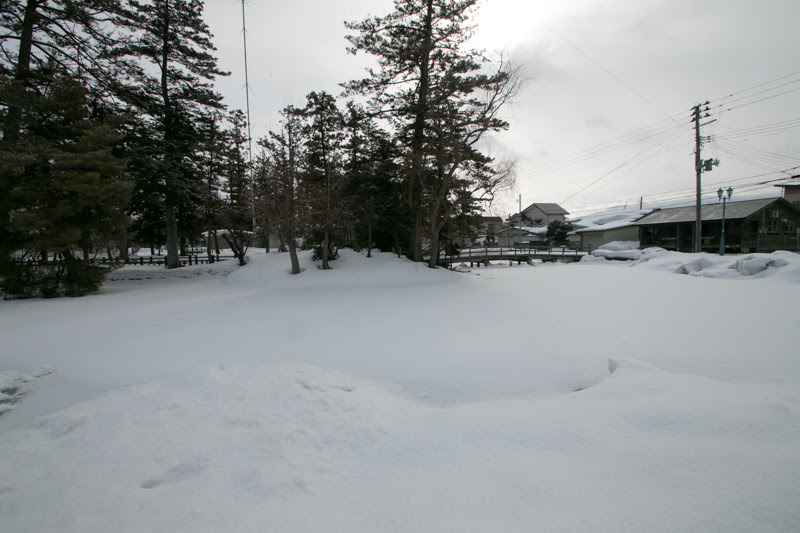 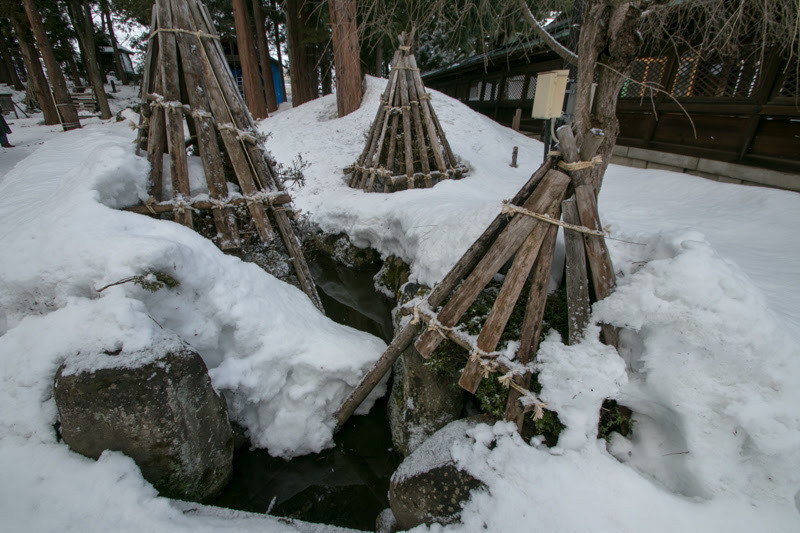 But in the latter half of 14th century, Date clan which was the small local lord of Date region at the next area of Yonezawa basin grew their power and intruded into Yonezawa basin. After fierce battle, finally Nagai clan was ruined in 1385 and the reign of Yonezawa basin changed to Date clan. 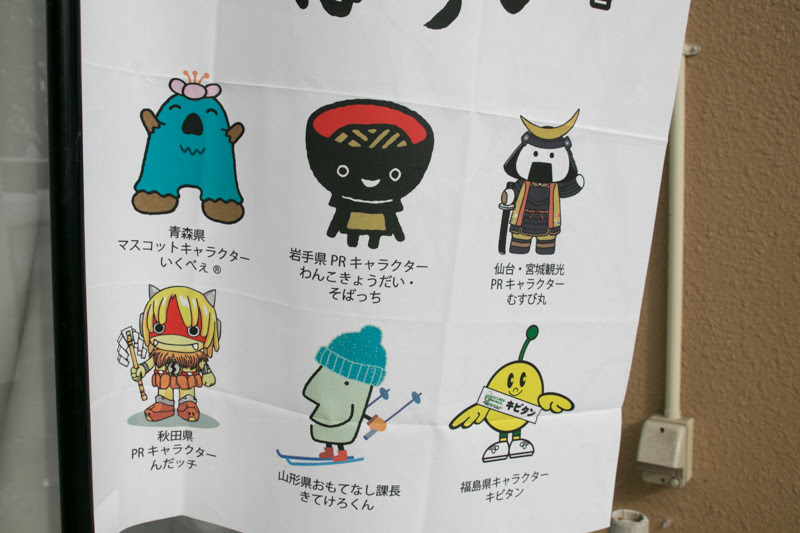 Date clan was originally a small retainer of north part of Kanto region but activated at the establishment of Kamakura Shogunate and became the local lord of Date region, which was the north part of current Fukushima prefecture. 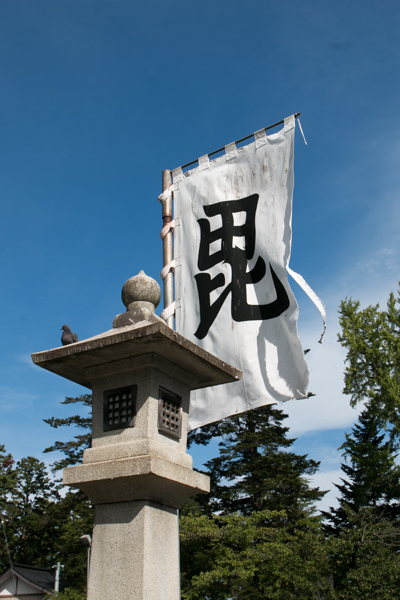 After the fall of Kamakura Shogunate, Date clan once belonged to Emperor Godaigo (1288-1339) side and resisted against Muromachi Shogunate, but later changed to Shogunate side and gradually grew its power throughout 14th century. 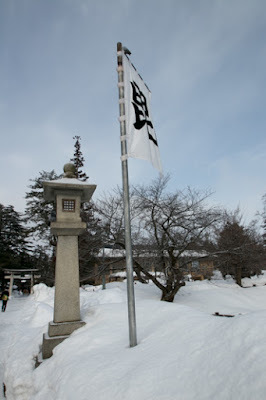 In the south half of Tohoku region at first relative of Shiba clan such as Osaki clan or Mogami clan held the power and authority, but both clan lost their power because of internal conflict. 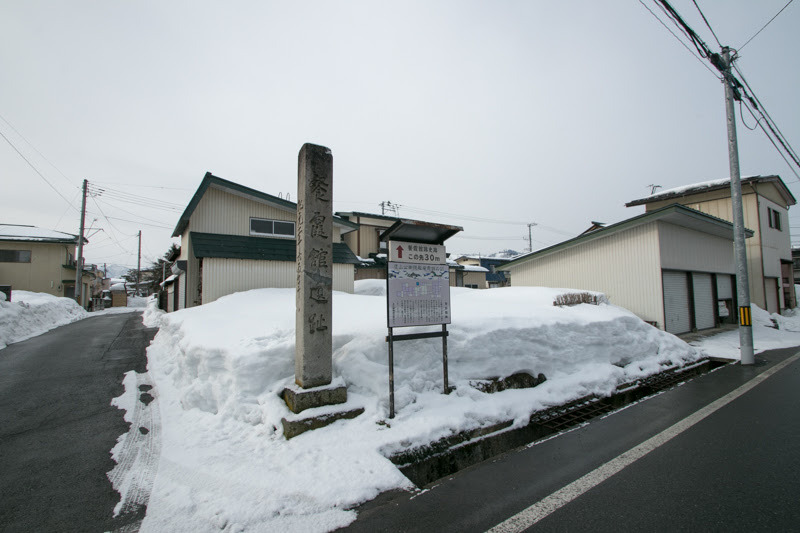 Date clan surpassed these two clans was appointed as the governor of vast Mutsu province (current Fukushima, Miyagi, Iwate and Aomori prefecture), and aggressively suppressed surrounding warlords in 15th century. 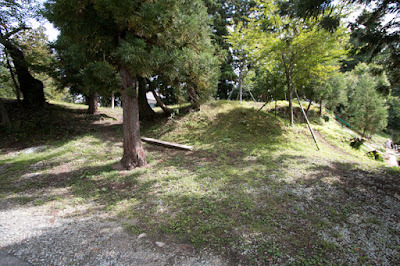 Main base of Date clan was still Korinishiyama castle at Dare region, but Yonezawa castle was an important branch castle for the clan. 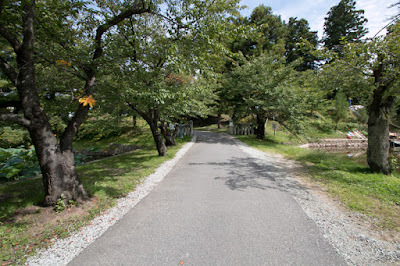 In the former half of 16th century, at the time of Tanemune Date (1488,1565), a great-grandfather of famous Masamune Date (1567-1636), Date clan rapidly grew their power by military action, send their son and daughter to surrounding warlords then subdued surrounding local lords and became a strong power at Tohoku region. 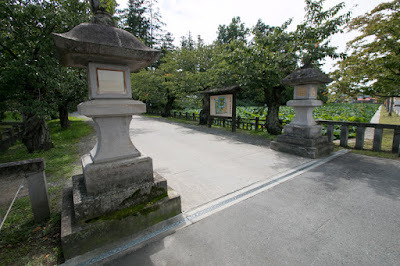 But arbitrary decision of Tanemune and intervention to Uesugi clan which was the governor of Echigo province (Niigata prefecture) brought dissatisfaction of retainers, then an internal conflict between Tanemune and his son Harumune Date (1519-1578) occurred. 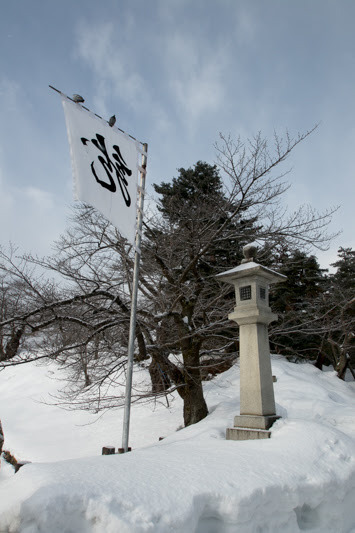 Tanemune retired after the battle and Harumune succeeded the leader position, but Date clan lost the power and authority during this conflict then surrounding warlords such as Ashina clan or Mogami clan left Date clan and became independent. 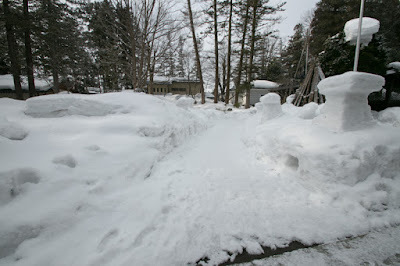 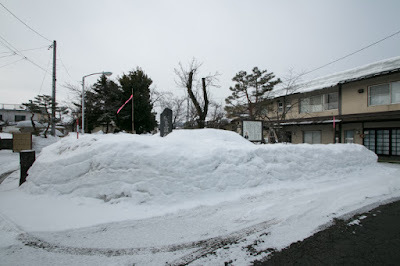 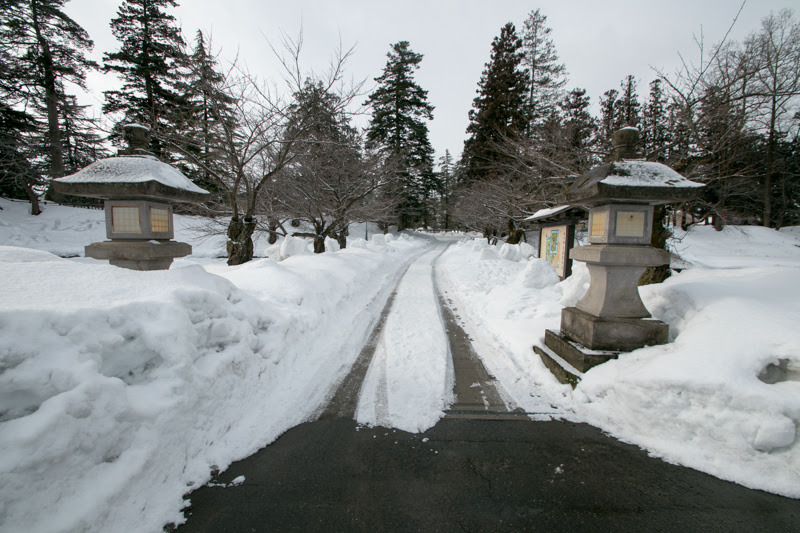 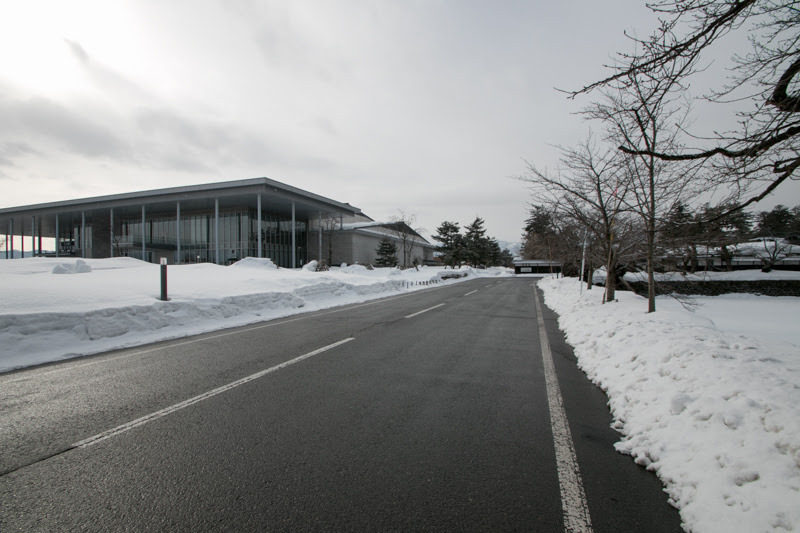 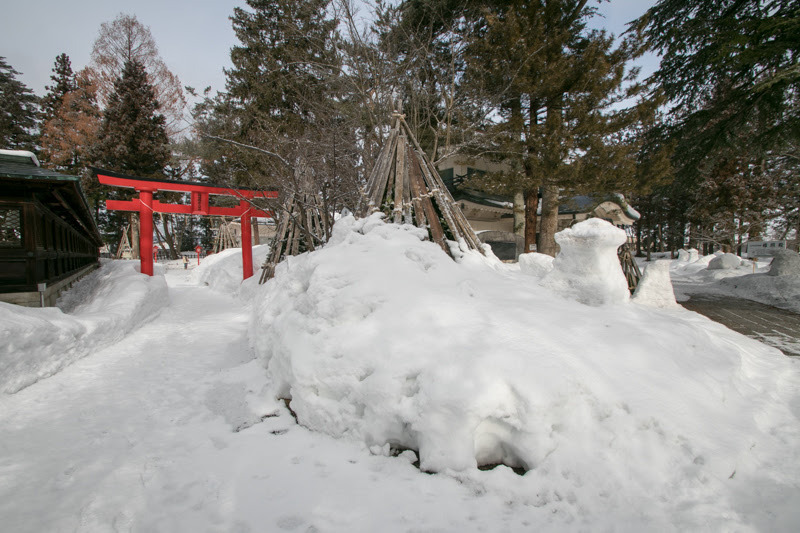 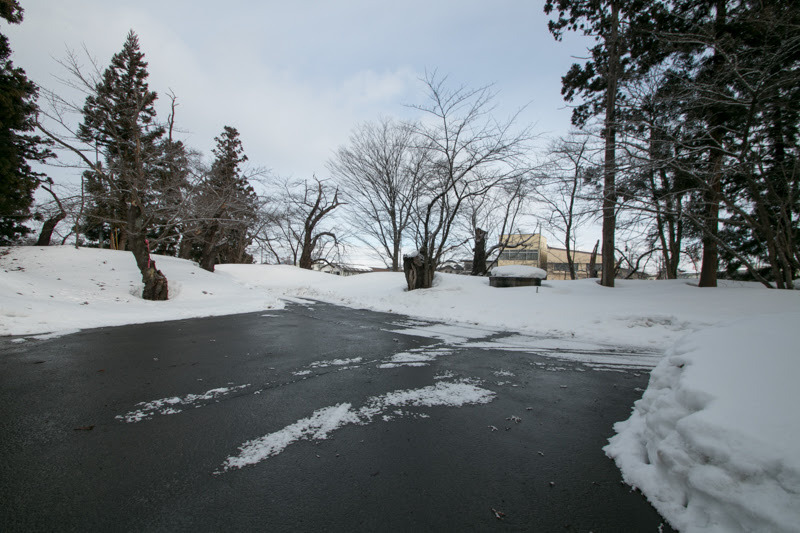 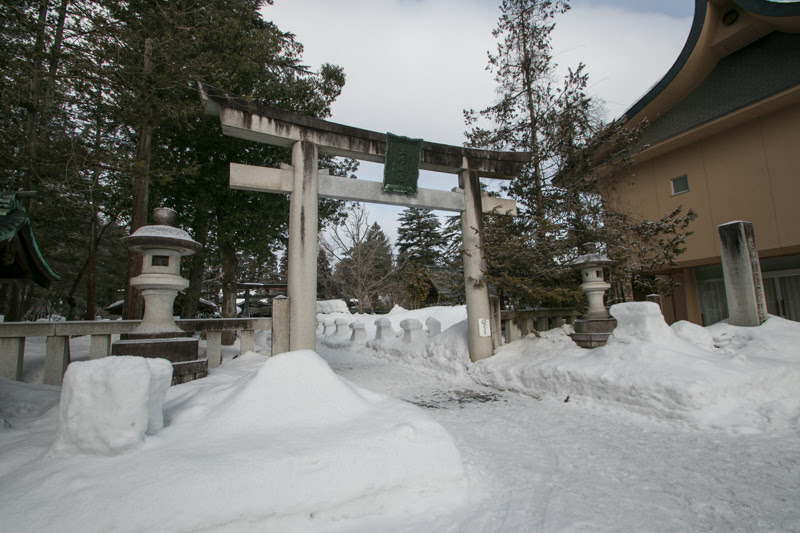 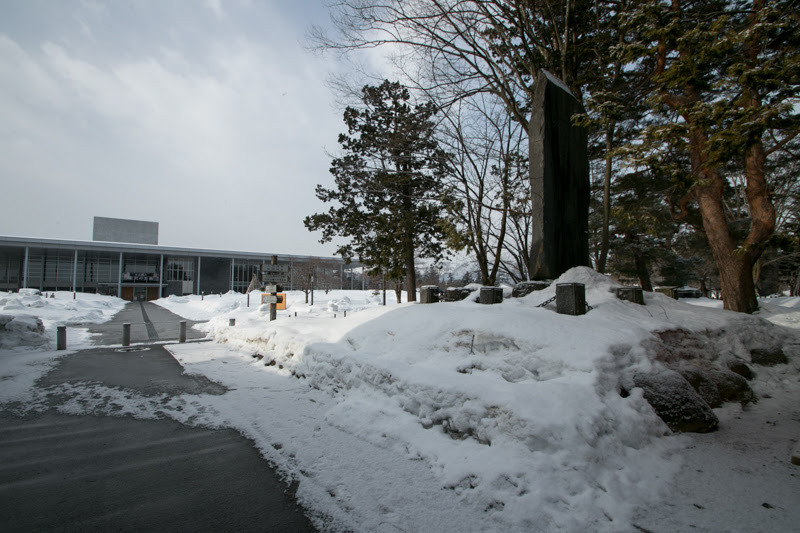 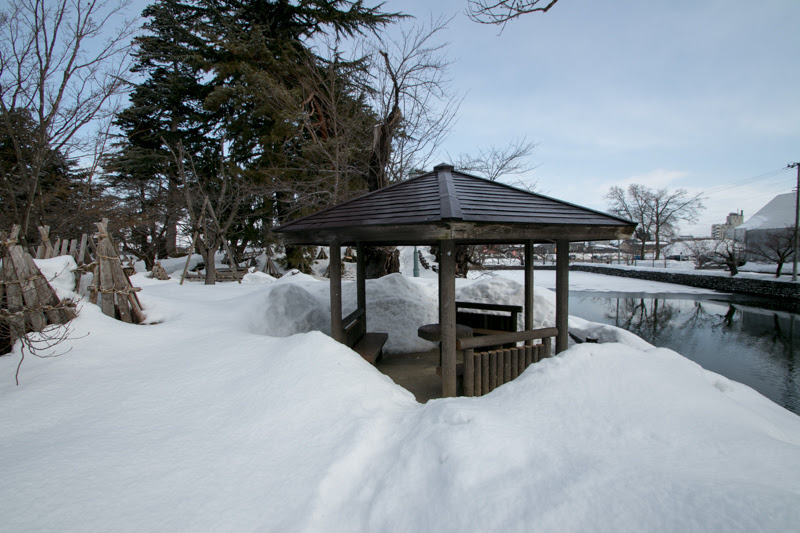 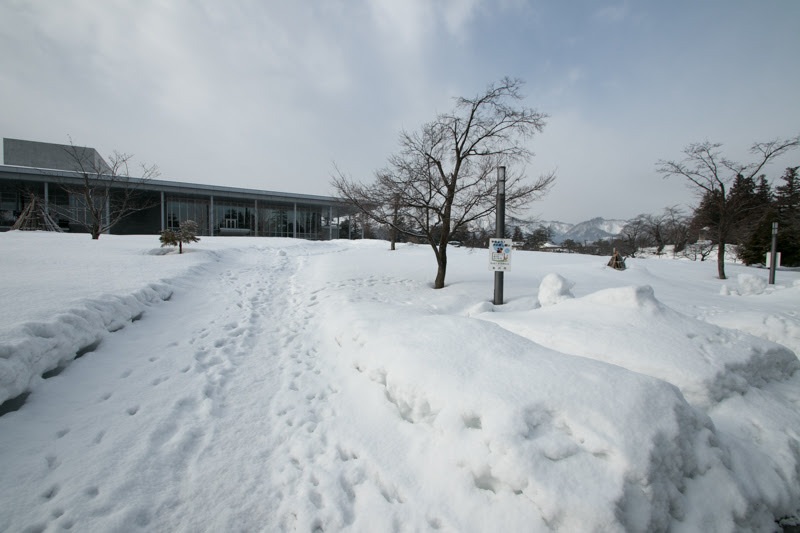 Harumune struggled to restore the situation and the power of Date clan began to increase again, and moved his main base from Kori Nishiyama castle (Fukushima prefecture) to Yonezawa castle to change the atmosphere. 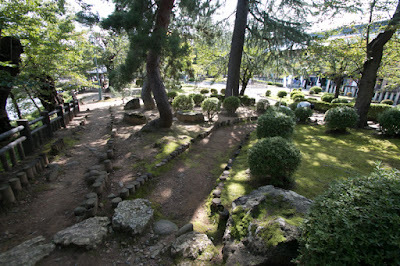 It took time for the recovery by the time of Terumune Date (1544-1585), the son of Harumune. 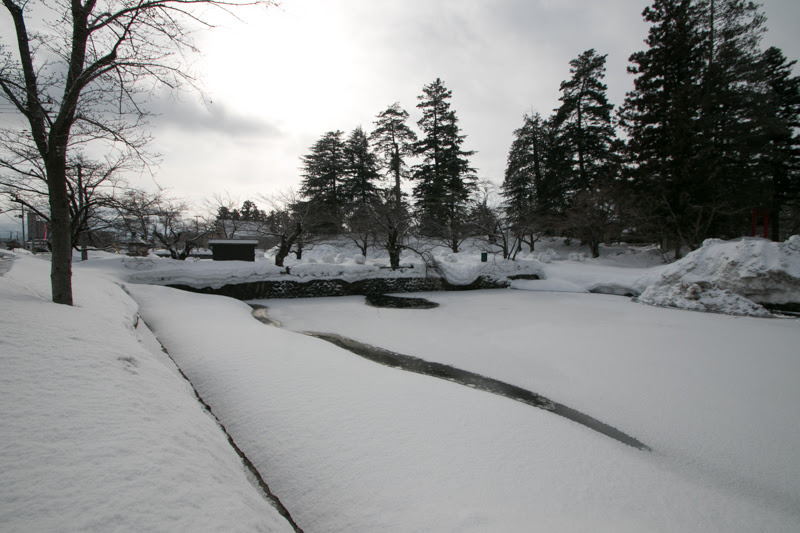 Masamune Date, the son of Terumune, was born at Yonezawa castle in 1567. 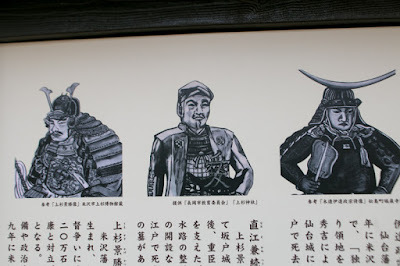 Masamune lost his one eye in ill when he was a child, but grew as a talented warlord being supported by his trusted retainers such as Kagetsuna Katakura (1557-1615) or Shigezane Date (1568-1646). Masamune became the leader of Date clan in 1584, and took the strict policy to surrounding warlords and aggressively invaded into surrounding areas. 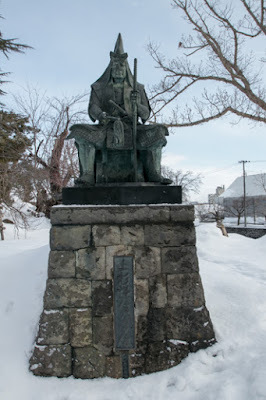 Facing the counterattack of the alliance of surrounding warlords Masamune sometimes fell into tough situation, but due to his decisive action finally Masamune ruined Ashina clan in 1589 and became the strong warlord which held most part of south half of Tohoku region. But at the same time, central ruler Hideyoshi Toyotomi (1537-1598) united whole part of central and western Japan and aimed at Kanto region for complete unification of Japan. 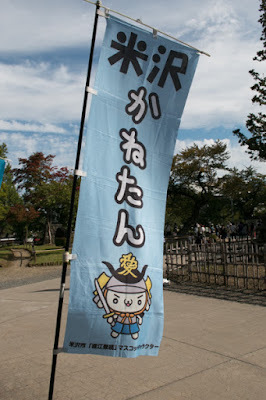 Masamune intended to oppose to Hideyoshi in alliance with Hojo clan which held whole Kanto region, but in 1590 Hideyoshi sent large army to subjugate Hojo clan and Hojo clan was ruined after four month battle. 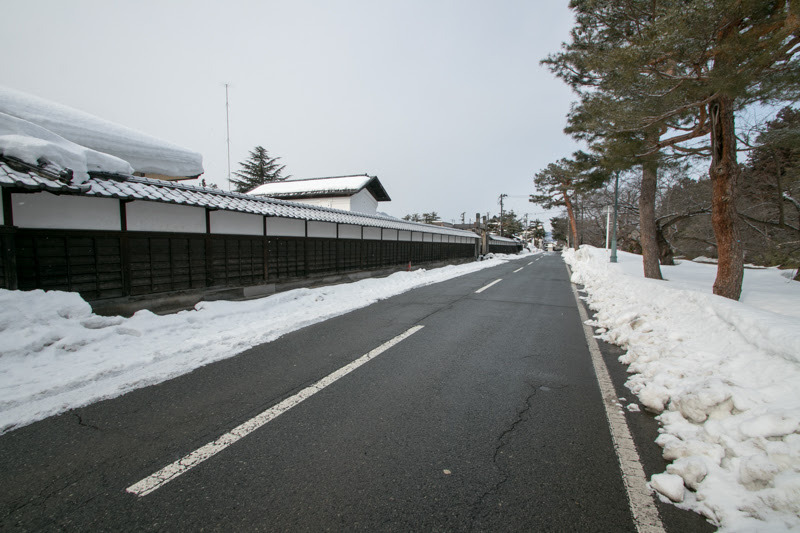 Seeing such situation Masamune finally followed to Hideyoshi and was forgiven, but Aizu region was confiscated by Hideyoshi. 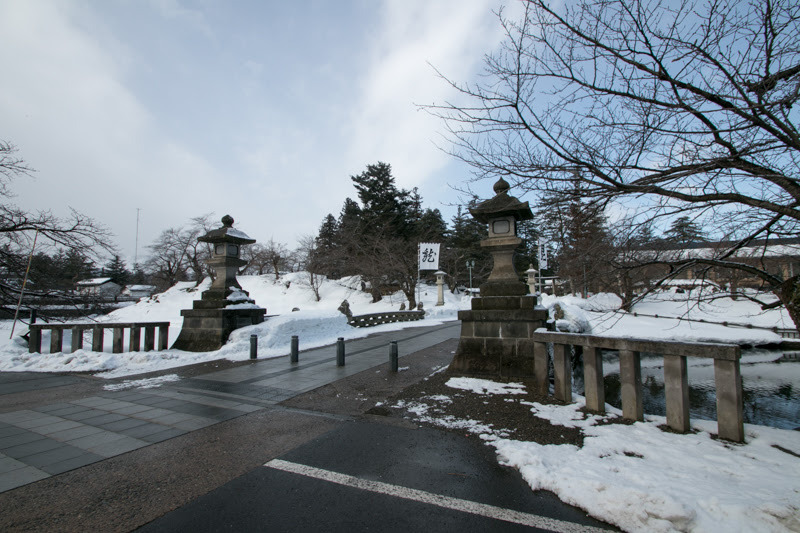 Furthermore, in 1591, because of the suspect to support rebellion of Kasai and Osaki area, Masamune was transferred to Sendai area and left Yonezawa castle. 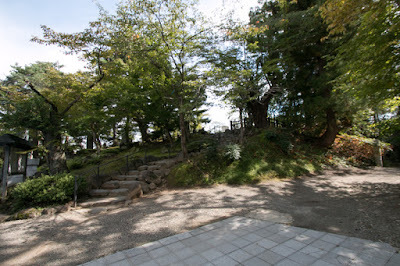 At first Masamune lived Iwadeyama castle but later built Sendai castle (Miyagi prefecture) and used it as a main base. 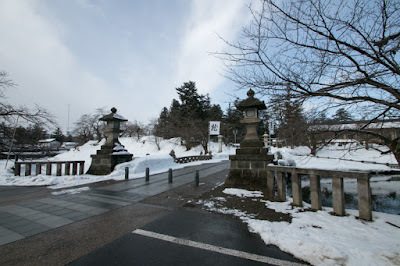 After the movement of Masamune Date, once Gamo clan became the lord of Aizu basin and Yonezawa basin, but in 1596 Kagekatsu Uesugi (1556-1623) was appointed as a large lord of Aizu area and Yonezawa area at AIzu Wakamatsu castle (Fukushima prefecture) and moved from Kasugayama castle (Niigata prefecture). 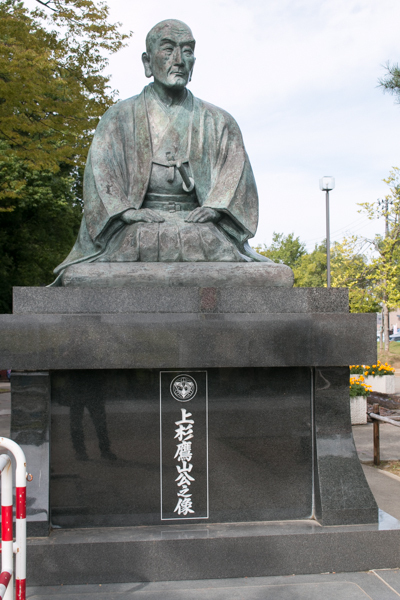 Kagekatsu Uesugi was an adopted son of Kenshin Uesugi (1530-1578), a warlord of Echigo province who was known for a genius at tactics and his honesty then praised as god of war. After the death of Kenshin, Kagekatsu defeated Kegetora Uesugi (1552-1579), another adopted son of Kenshin and succeeded Uesugi clan. Uesugi clan was once forced to the corner of extinction by central ruler Nobunaga Oda (1530-1578), but barely survived by the death of Nobunaga at the incident of Honnoji in 1582 and followed to Hideyoshi Toyotomi who became the next ruler from early time. 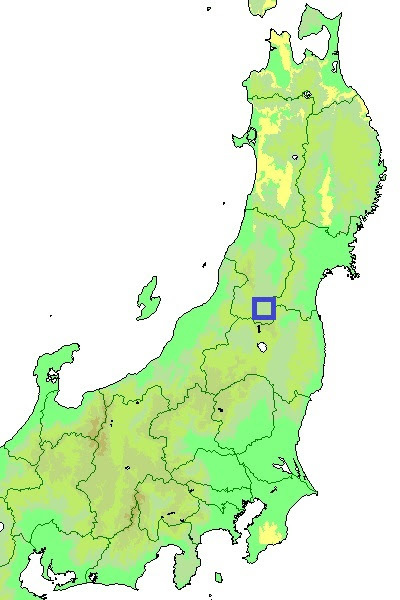 Territory of Uesugi clan consist of four basin it mean Aizu basin, Koriyama basin, Fukushima basin and Yonezawa basin, and distant Tsuruoka area at southwest edge of Dewa province (Yamagata prefecture). 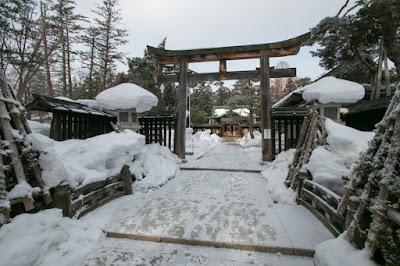 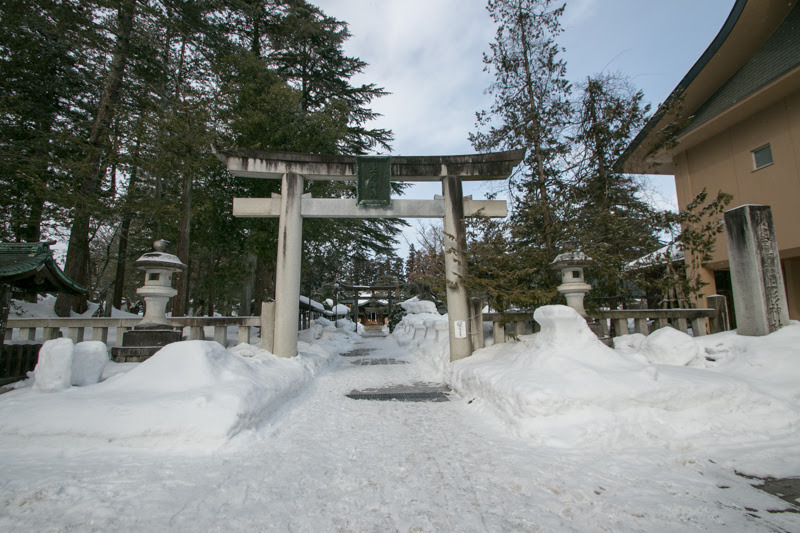 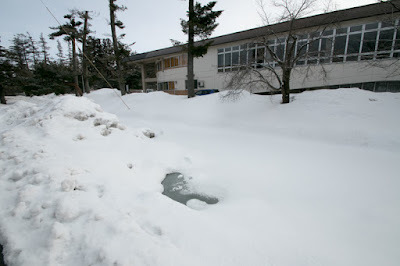 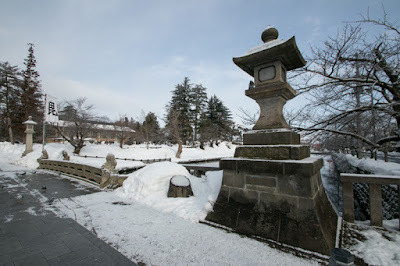 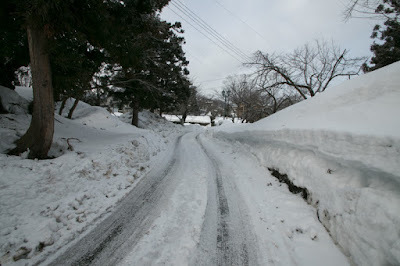 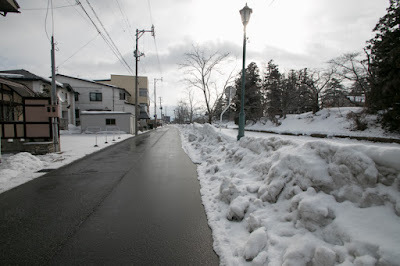 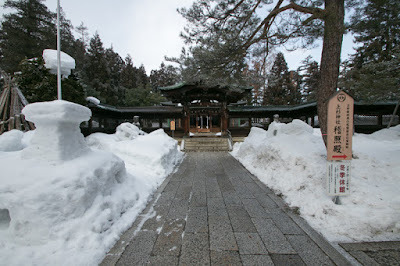 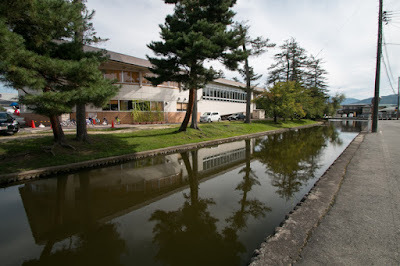 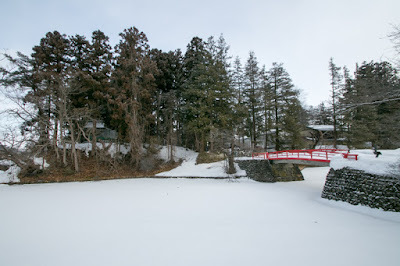 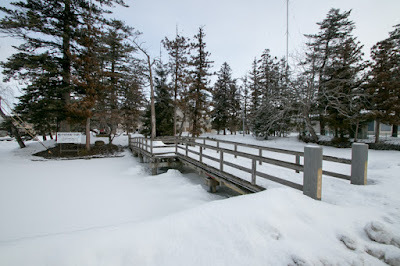 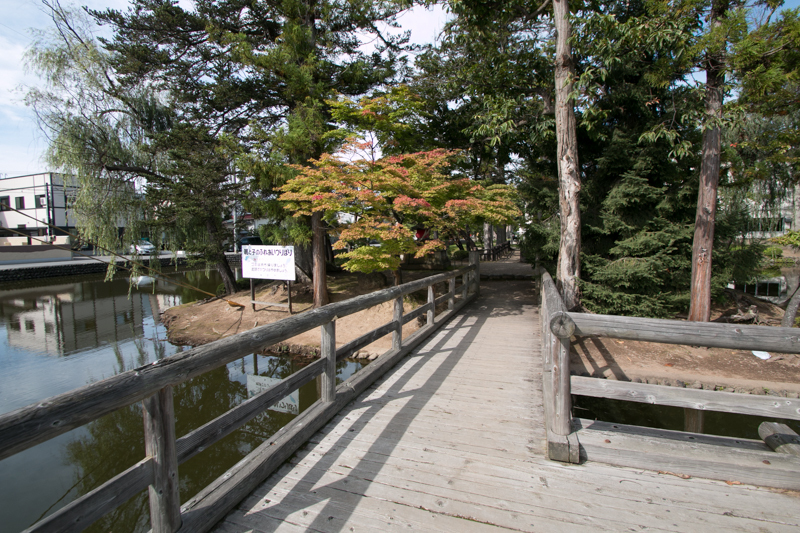 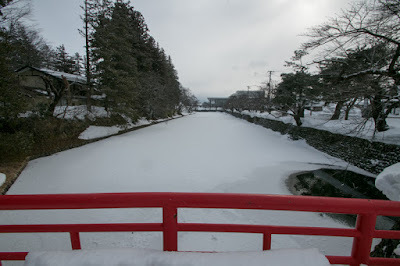 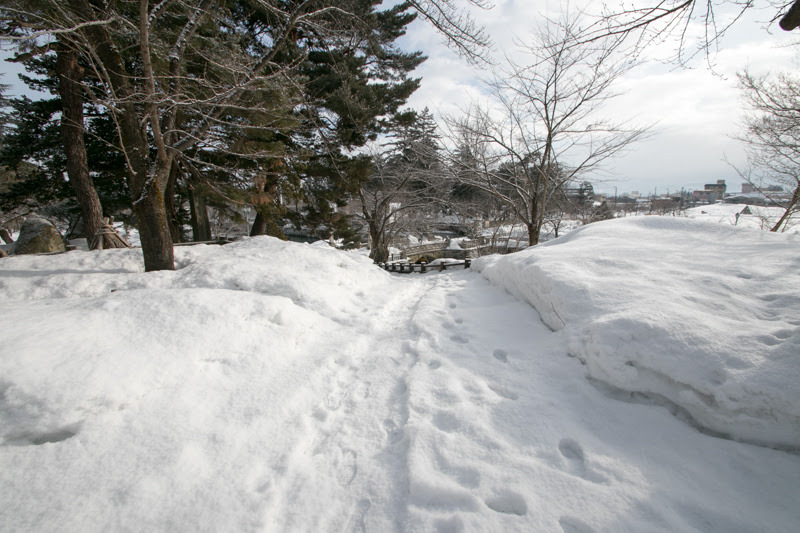 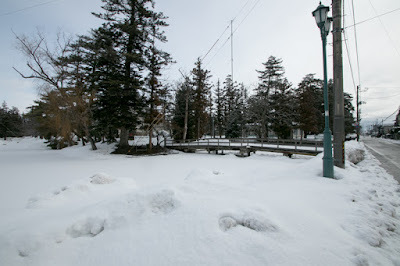 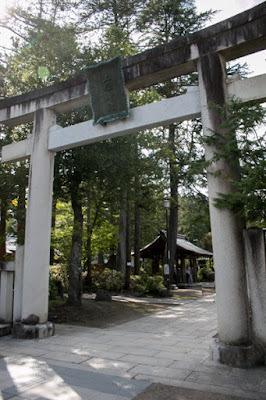 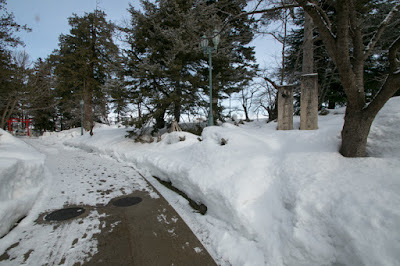 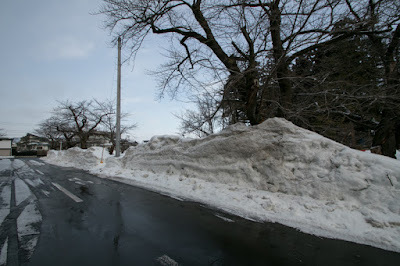 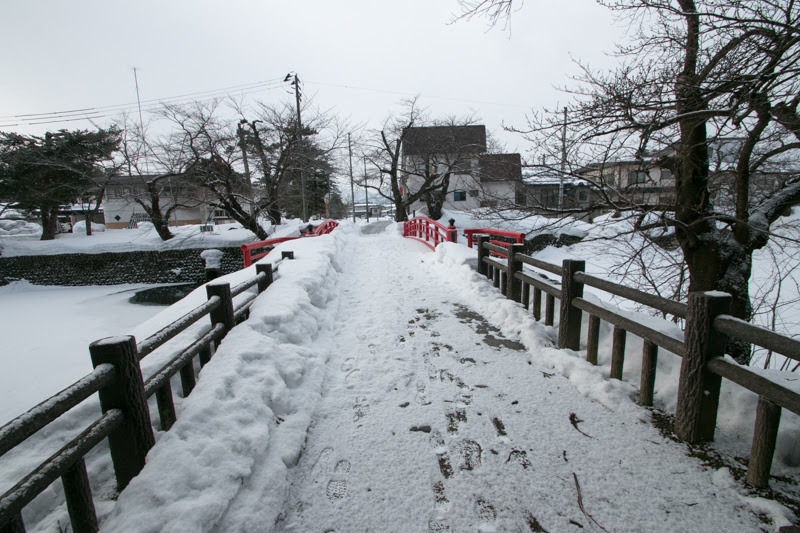 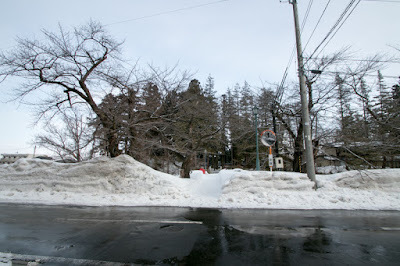 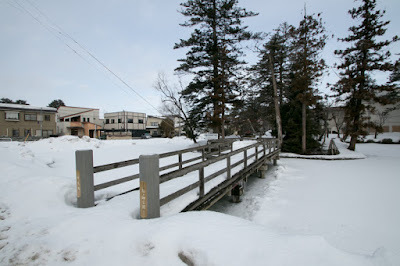 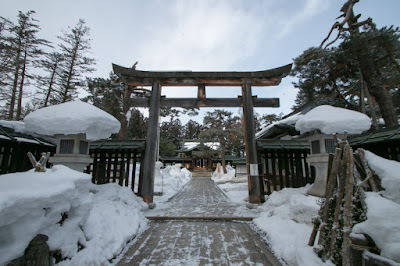 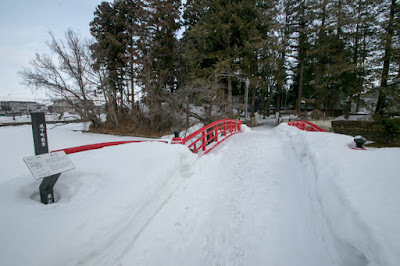 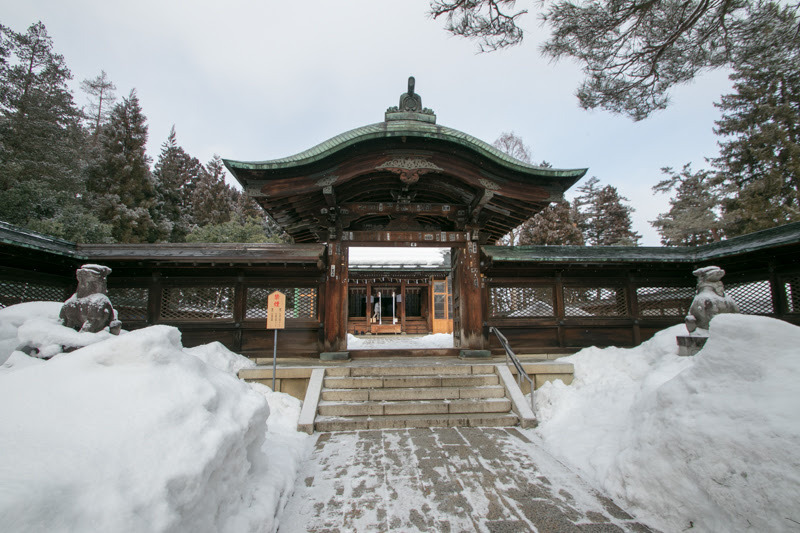 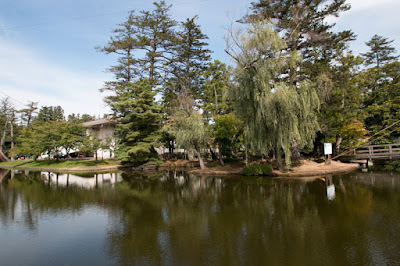 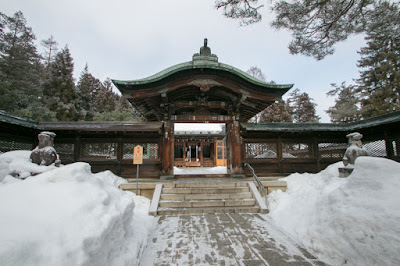 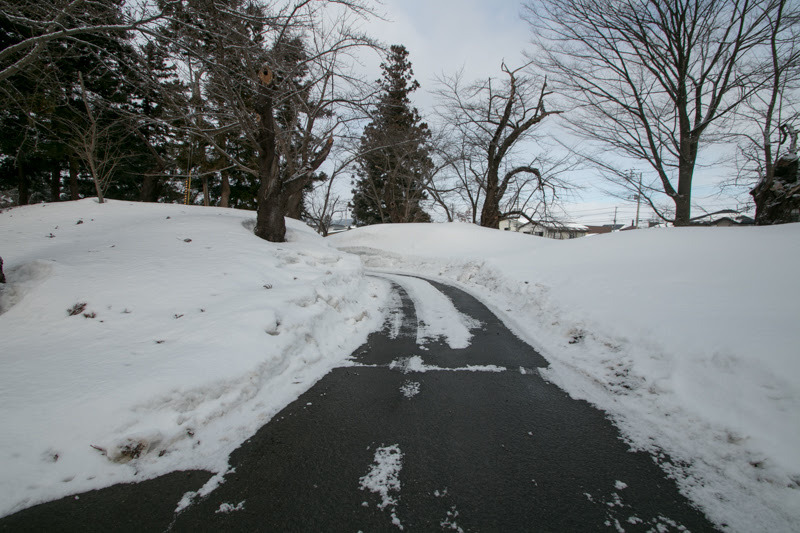 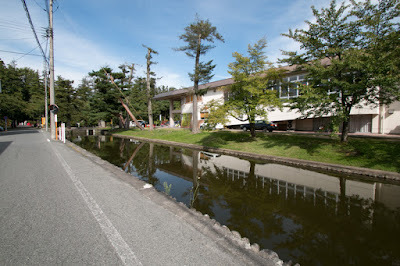 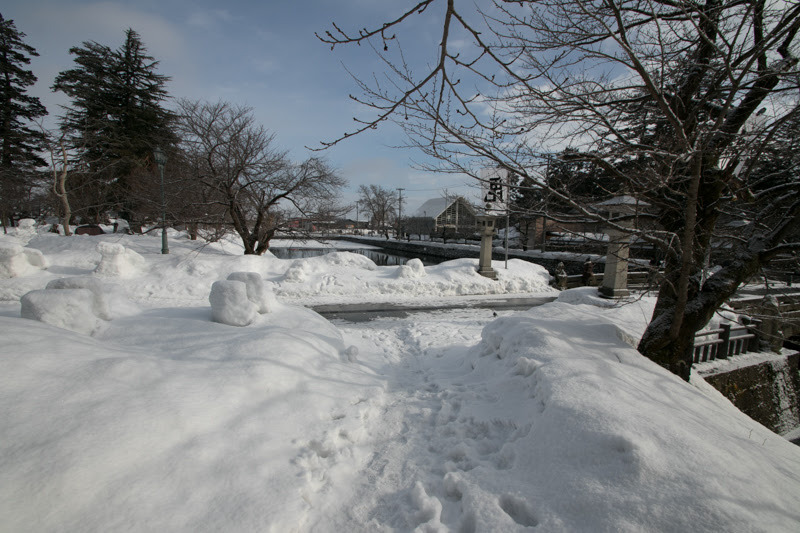 Yonezawa area is a connecting point of these territories, then Kagekatsu placed his trusted chancellor Kanetsugu Naoe (1559-1620) who was originally a lord of Yoita castle (Niigata prefecture) as a lord of Yonezawa castle. 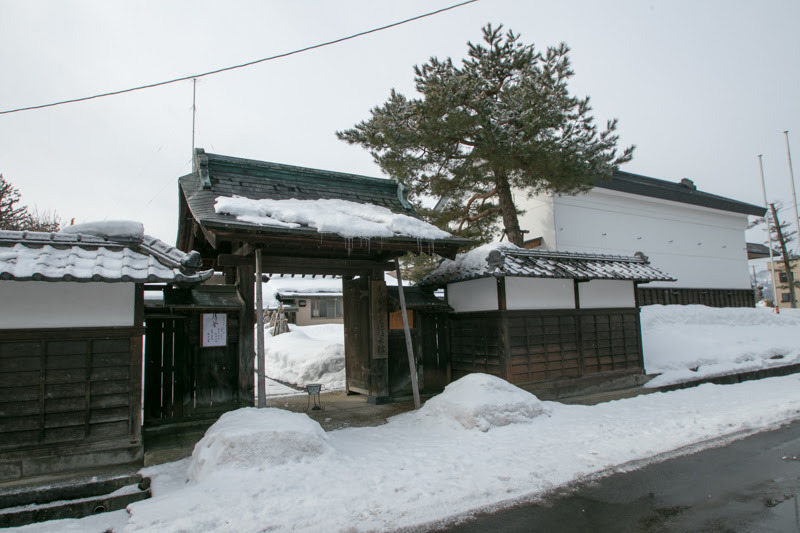 Kanetsugu was born as a son of retainer of Ueda Nagao clan, which was a birthplace of Kagekatsu. 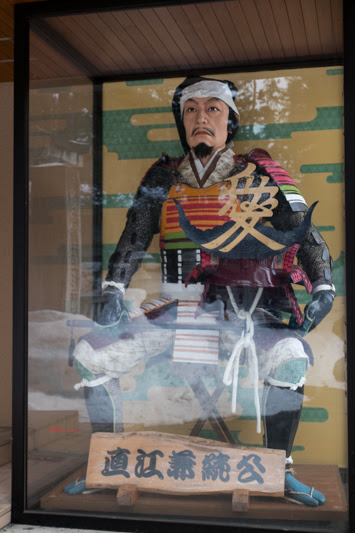 Kanetsugu served to Kagekatsu from youth, and after grow up Kanetsugu became a commander of direct force of Kagekatsu and activated at the battle against Kagetora Uesugi or Shigeie Shibata (1547-1587) who was the lord of Shibata castle and rebelled against Kagekatsu. 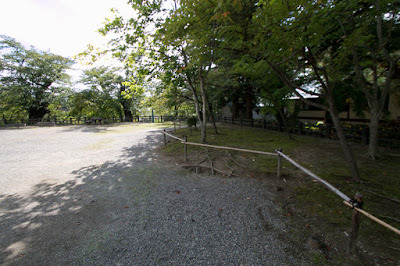 Kanetsugu also had a talent on administration, and processed negotiation of subordination of Uesugi clan to Hideyoshi with Mitsunari Ishida (1560-1600), the chief administrative staff of Hideyoshi. 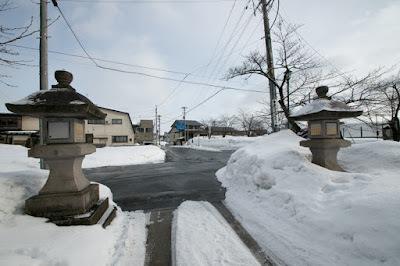 Under Kagekatsu, Kanetsugu totally managed Uesugi clan as a chancellor, and was praised along with Takakage Kobayakawa (1533-1597) at Mouri clan and Naoshige Nabeshima (1537-1619) at Ryuzoji clan at same situation. After the death of Hideyoshi, Ieyasu Tokugawa (1543-1616) who was the largest lord under Toyotomi government aimed at next hegemony and accused Kagekatsu for having an intention of rebellion, to mobilize other lords. 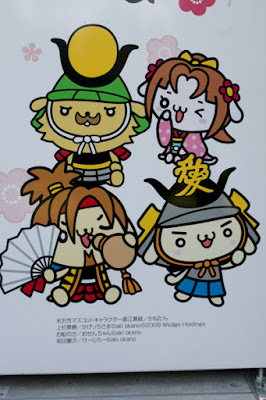 In response to this, Uesugi clan decided to resist against Ieyasu then Kanetsugu sent a war declaration letter to Ieyasu. Mitsunari Ishida planned to raise his army against Ieyasu at his absence, then Kanetsugu and Mitsunari might have planned to do so in advance. 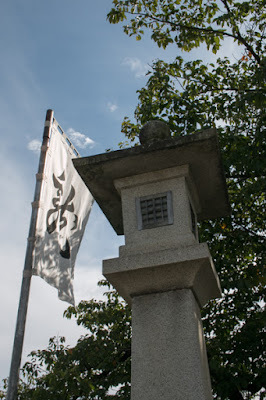 Beside this, Uesugi clan might have planned to seize Eastern Japan utilizing conflict of Ieyasu and Mitsunari. 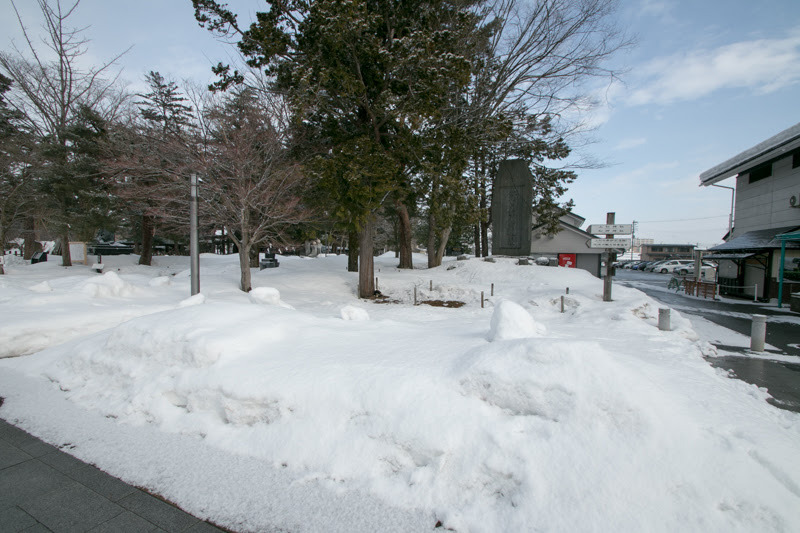 Anyway Kagekatsu mobilized all force and prepared for the battle with Ieyasu. In June 1600, allied force of Ieyasu and other lords marched to Oyama castle (Tochigi prefecture) knew the raise of Mitsunari at Kinki region. Ieyasu decided to return to Kinki region and have a decisive battle with Mitsunari. Utilizing the return of Ieyasu, Kagekatsu ordered Kanetsugu to attack Yoshiaki Mogami (1546-1614) who was the lord of Yamagata castle (Yamagata prefecture) from Yonezawa castle. 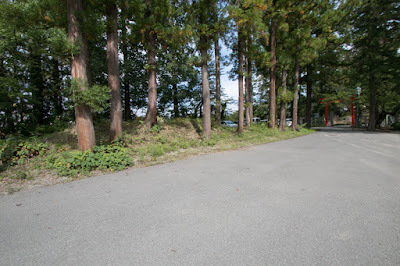 Kanetsugu lead 20,000 soldiers and attacked Mogami territory, then fell Hataya castle and surrounded Hasedo castle. 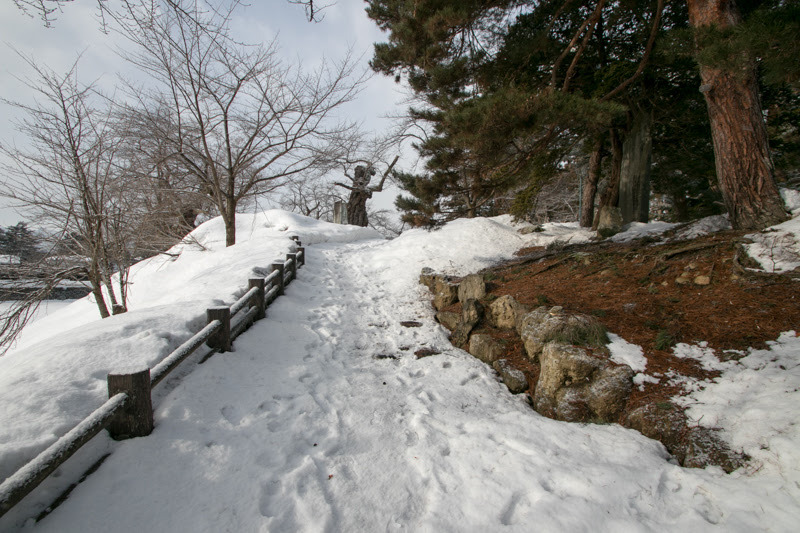 But during the siege, Ieyasu defeated Mitsunari at the battle of Sekigahara in September 1600 then Kanetsugu had to cancel the invasion and return to Yonezawa castle. Finally Uesugi clan made peace with Ieyasu, under condition of confiscating territory other than Yonezawa area. 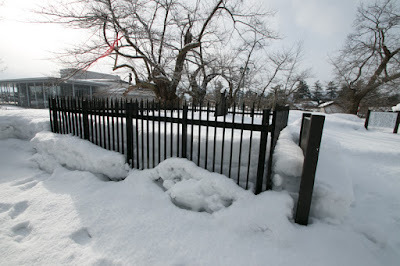 Kagekatsu Uesugi became the lord of Yonezawa domain and moved to Yonezawa castle as a main base. 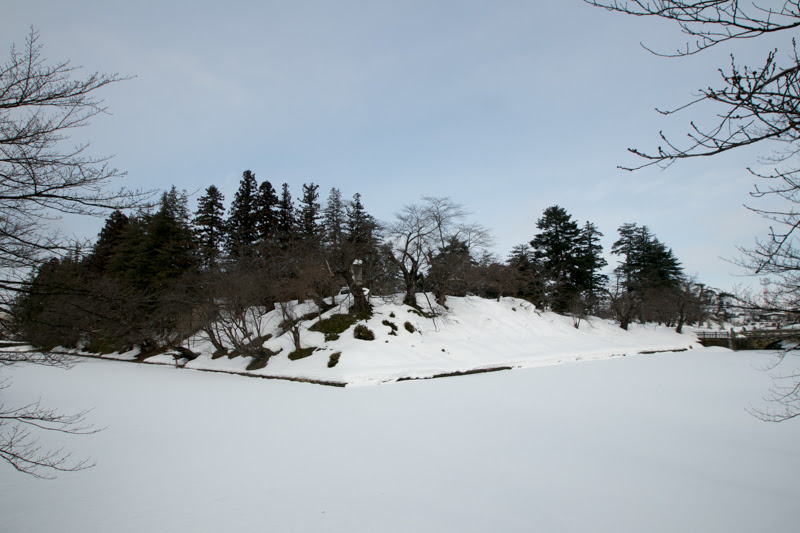 Kagekatsu reformed Yonezawa castle as residence of large lord. 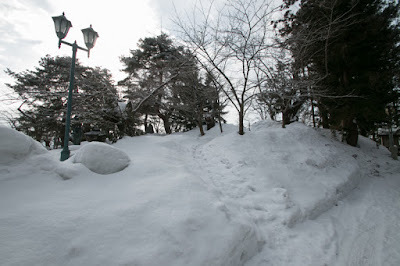 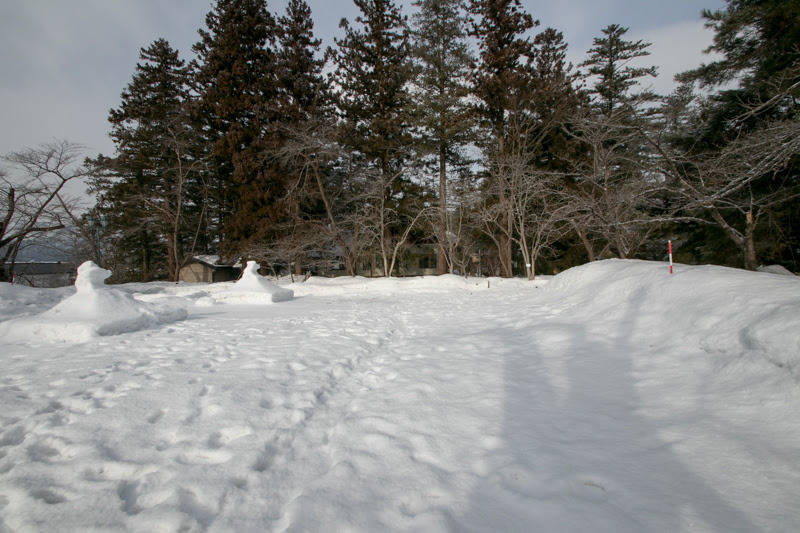 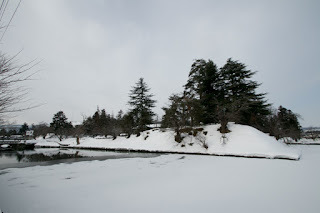 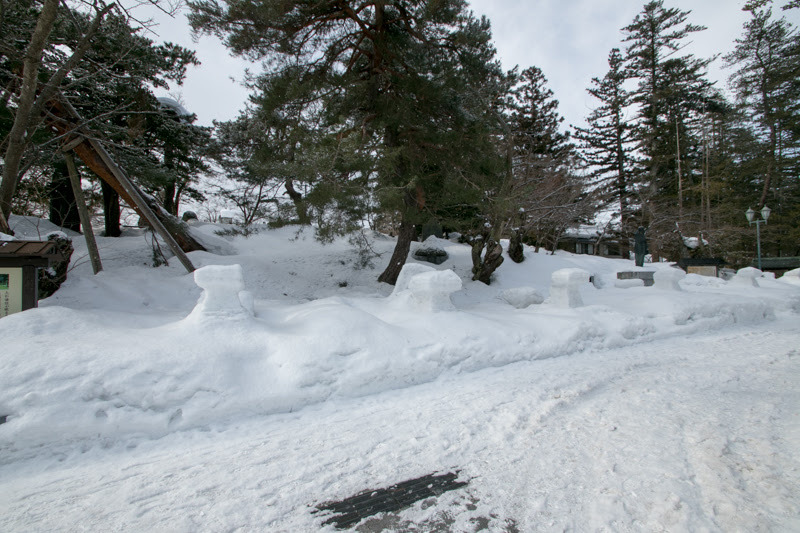 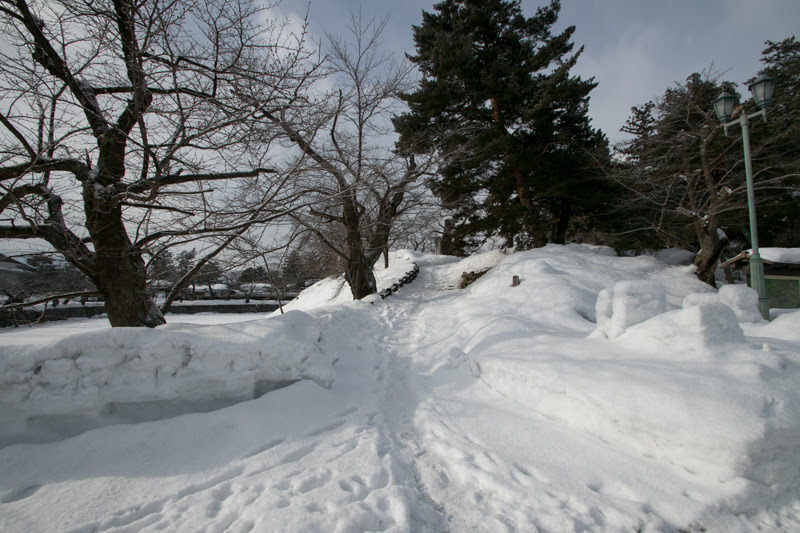 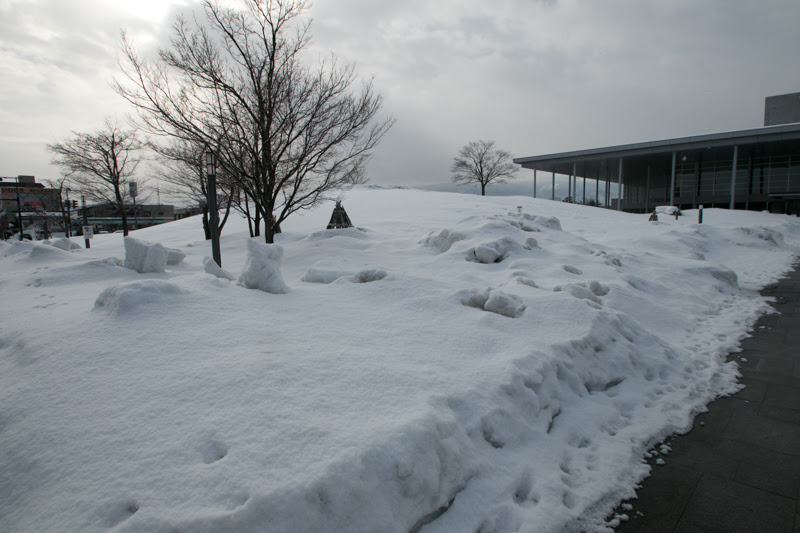 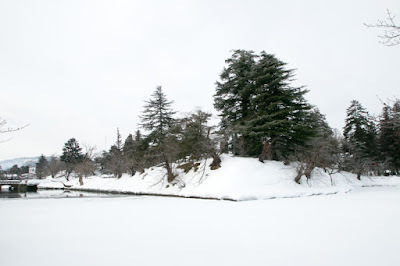 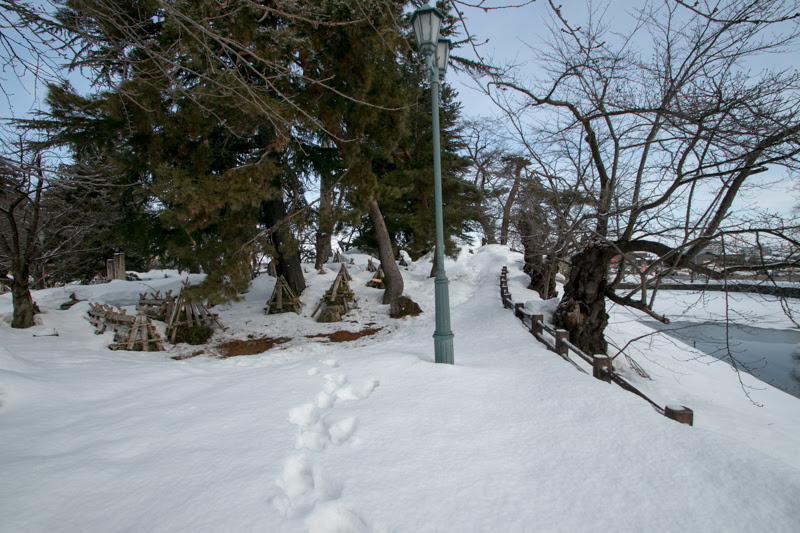 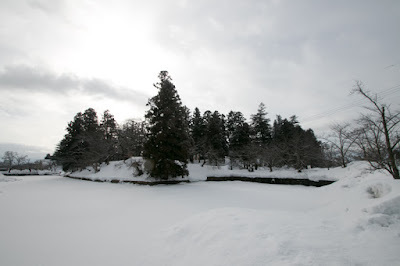 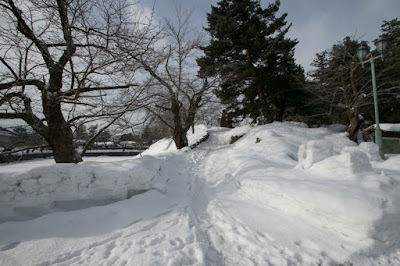 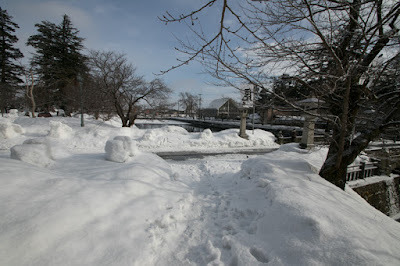 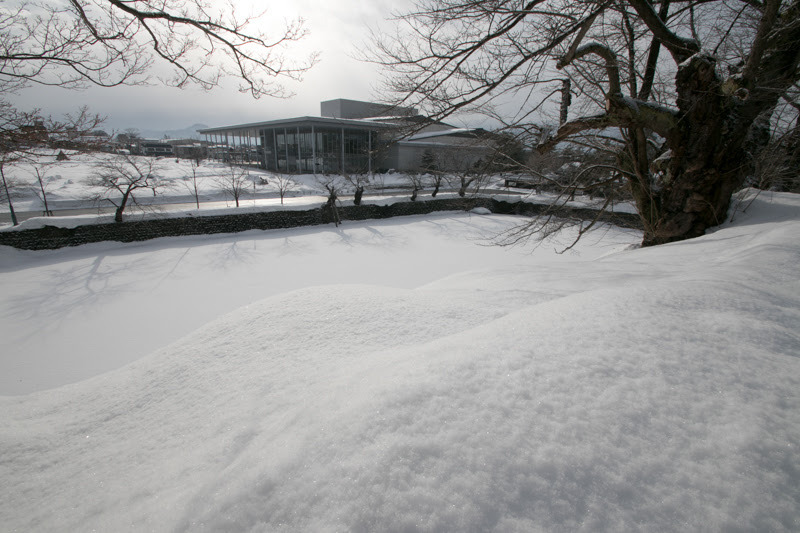 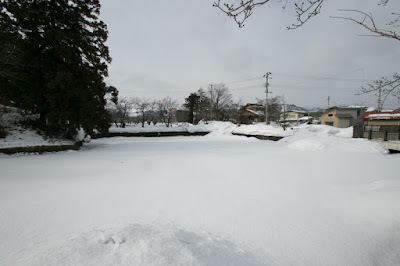 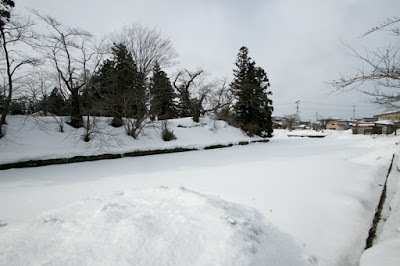 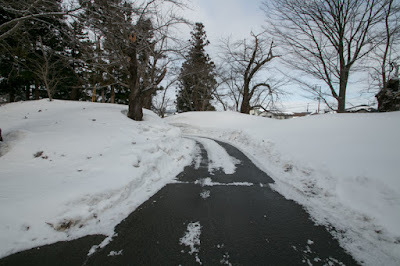 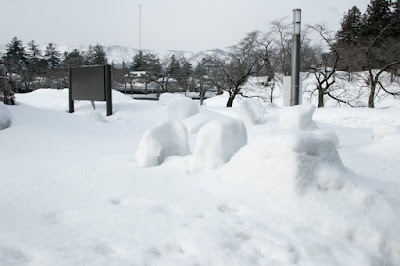 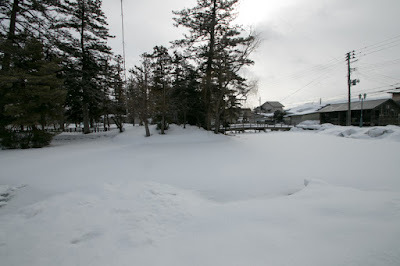 Yonezawa castle is a simple castle consists of two layer of square shaped area. 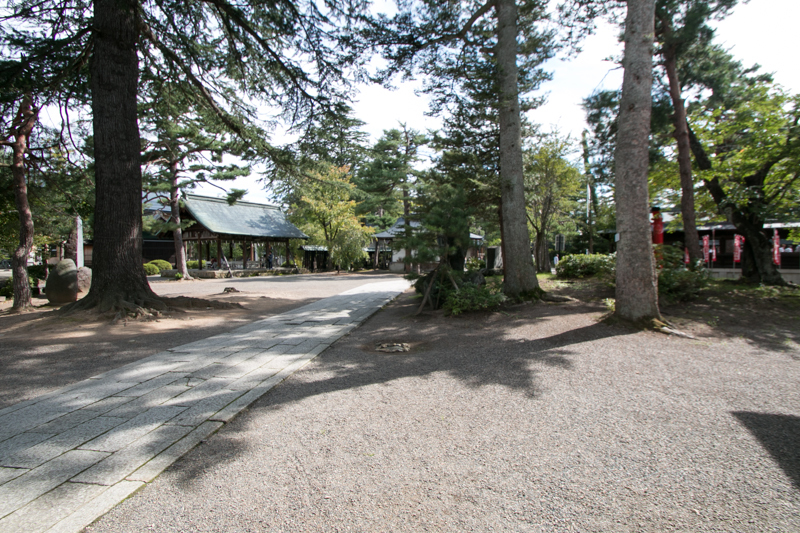 Central area at inside is a 200 meter long square shaped area, which is a traditional style residence of the governor in Muromachi era similar to Tsutsujigasaki palace (Yamanashi prefecture) of Takeda clan. At northeast and southwest corner two three story turret were built as substitute of main tower, and a temple commemorated Kenshin Uesugi was built at southwestern corner. Secondary area outside of central area is a 400 meter square shaped area, and had gates at each direction. 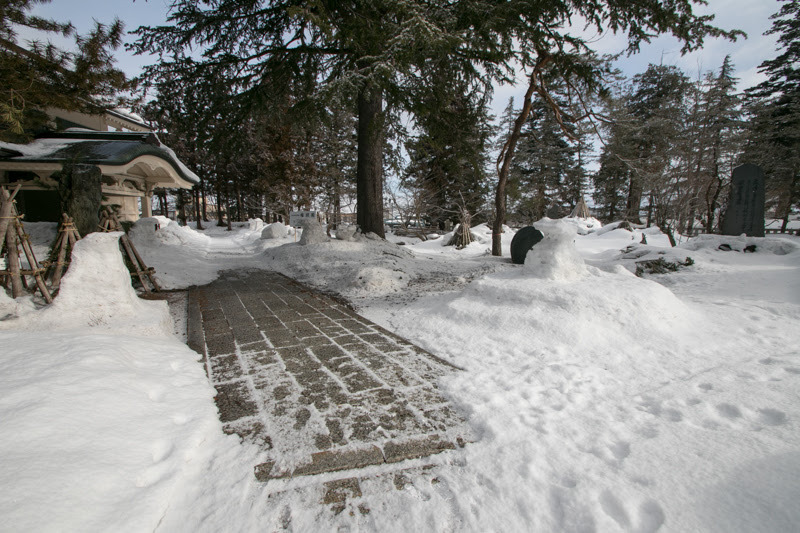 Outside of secondary area, third area which is a rectangular shape of about 1,000 meter long and 500 meter wide was built and used for residence of retainers. 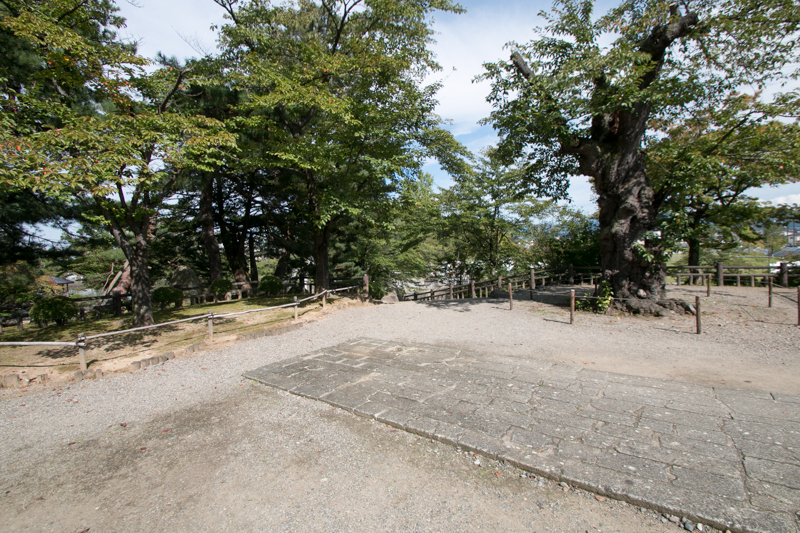 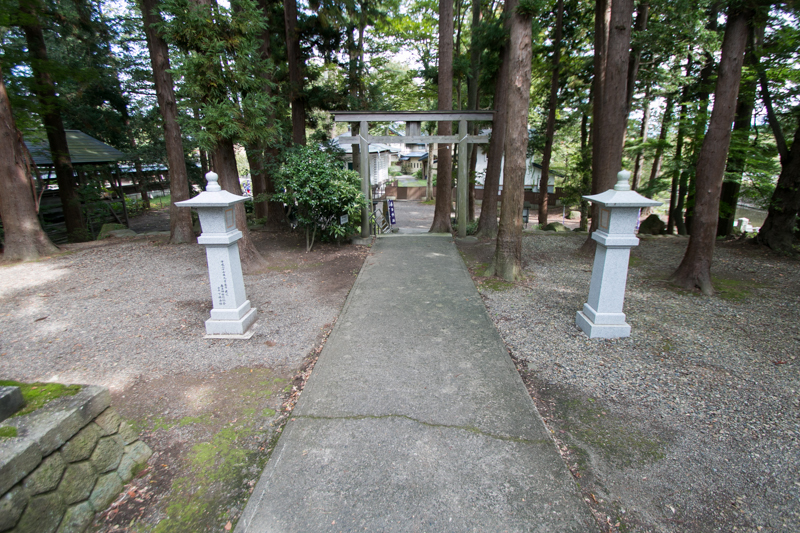 Outside of third area many temples were built surrounding the castle, to work as a first defense line of castle. Yonezawa castle did not have stone walls and secure gate even though renovated after 1600, as consideration to Edo Shogunate and severe fiscal situation. 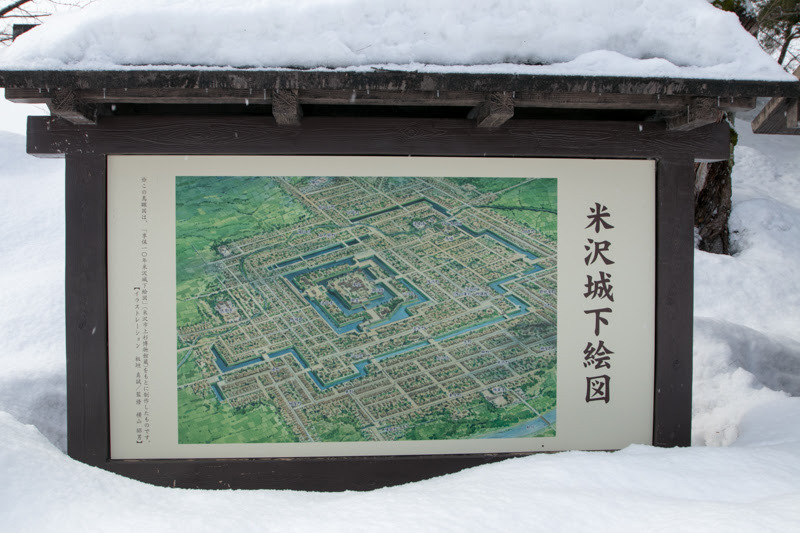 Uesugi clan could survive as a feudal lord under Edo Shogunate, but its territory was significantly decreased then its financial condition became poor. Kanetsugu proceeded development of territory, but the number of soldiers were fundamentally too much. Furthermore, in the latter half of 17th century the leader of Uesugi clan died without successor, and barely the continuation of domain was approved but its territory was further decreased to the half as a penalty. Uesugi domain was on the corner of bankrupt in 18th century. 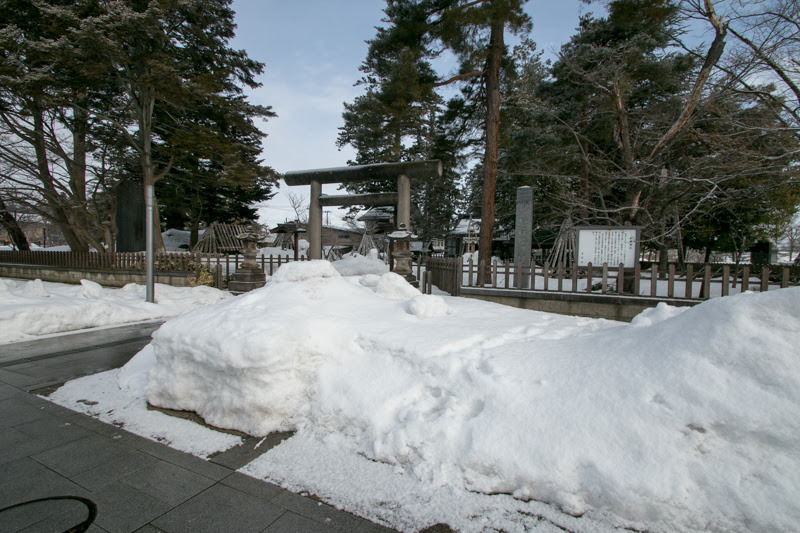 Among such situation, Yozan Uesugi (1751-1822, original name was Harunori but known as another name Yozan) became the lord. 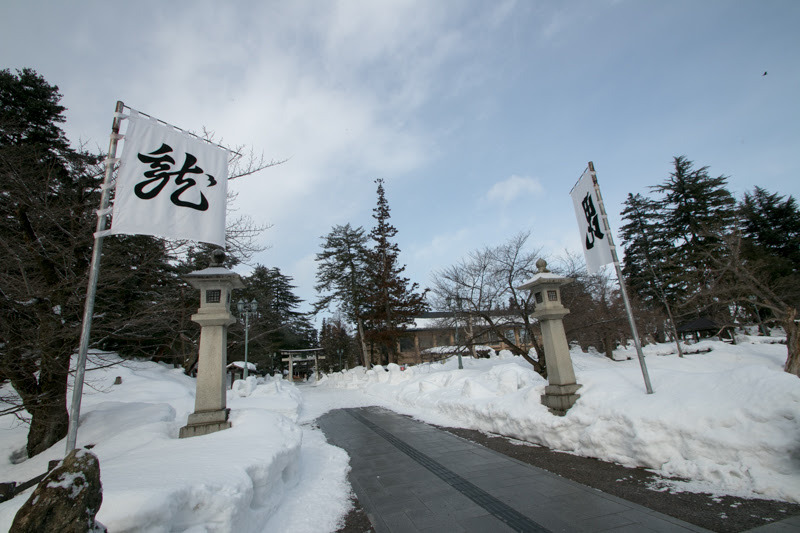 Yozan started his reform including industrial and agricultural promotion, expenditure control, establishment of domain school and social welfare. 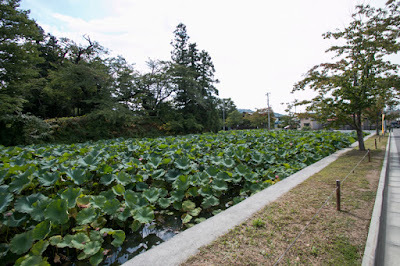 In 1780’s Tohoku region suffered severe famine, but Yozan prepared substitute crops and emergency stock in advance then limited the damage of famine. Yozan died in ill in 1822, but next year Yonezawa domain repaid all debts and stabilized the situation. Because of this successful story, Yozan is still respected by as an excellent lord. 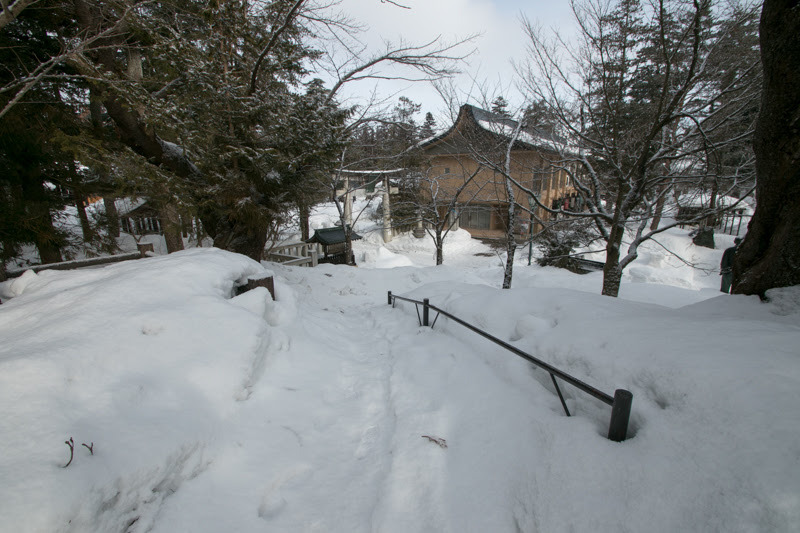 Restored Uesugi clan held Yonezawa castle by the end of Edo era. 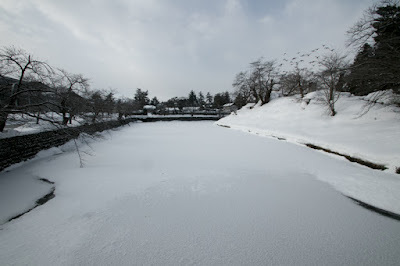 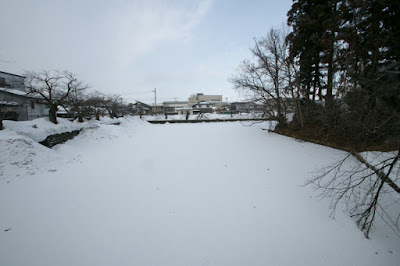 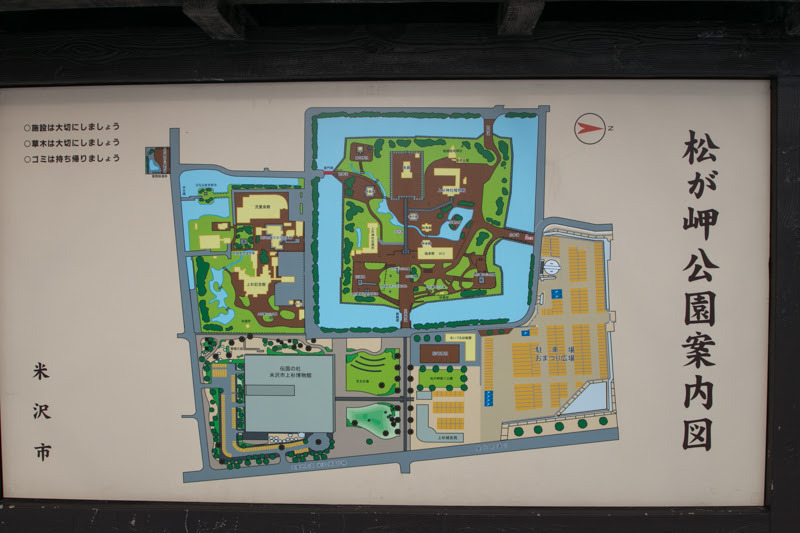 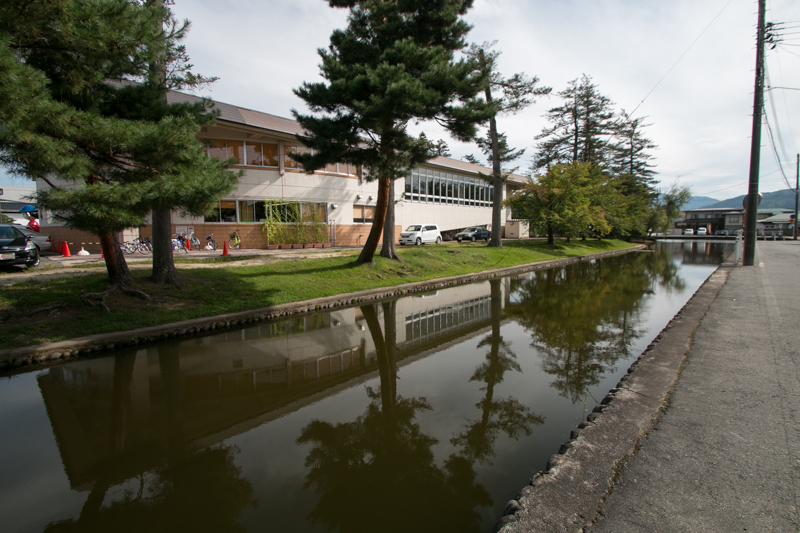 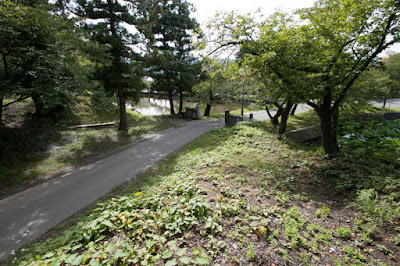 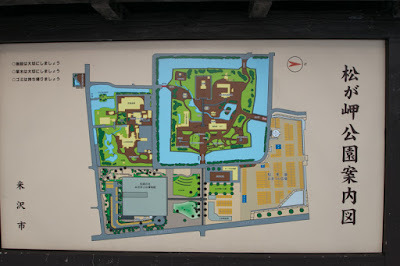 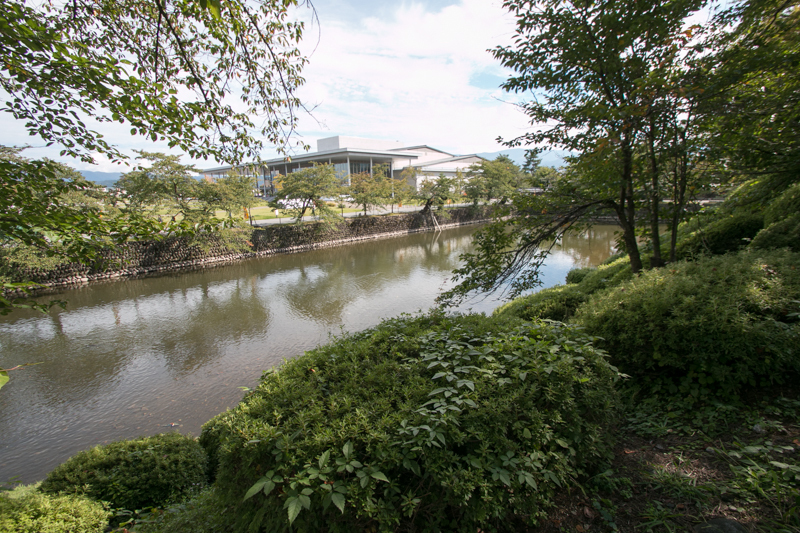 Subsequent to Meiji revolution, all building was lost and water moat of secondary area and third area were reclaimed. 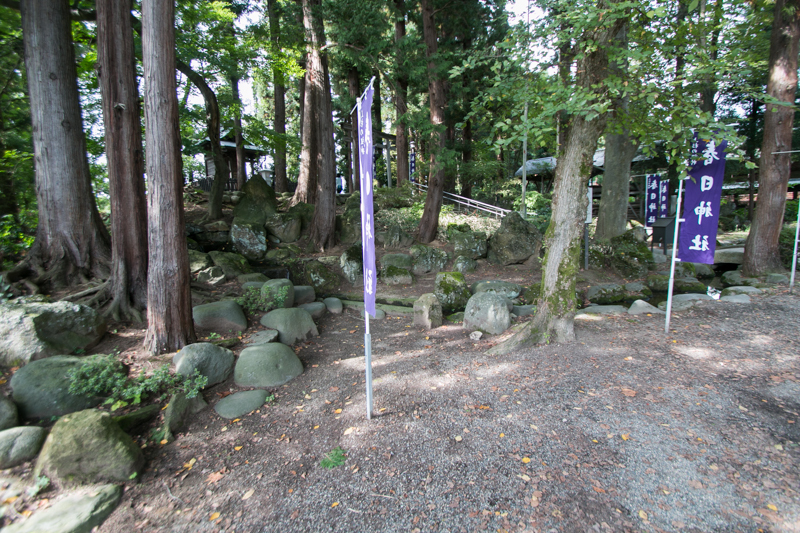 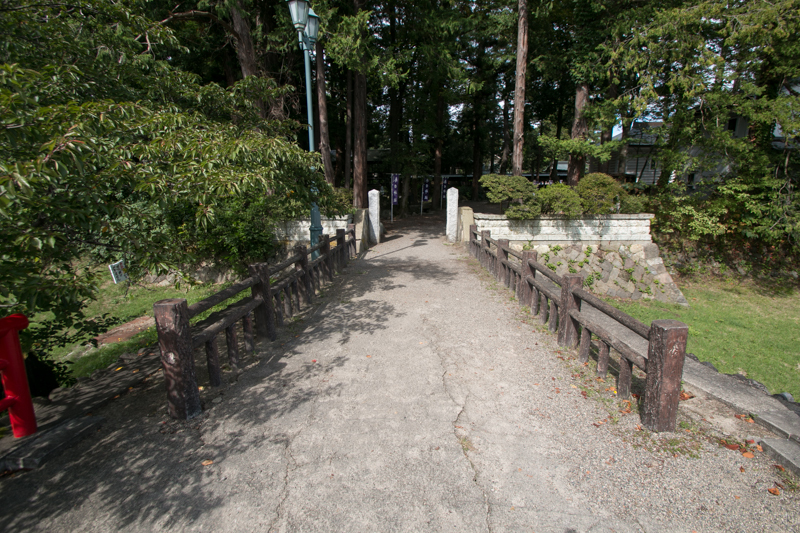 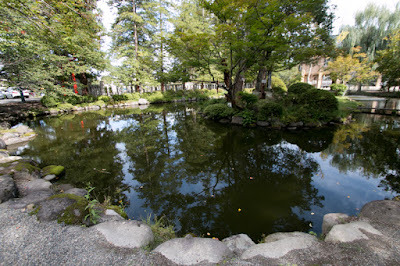 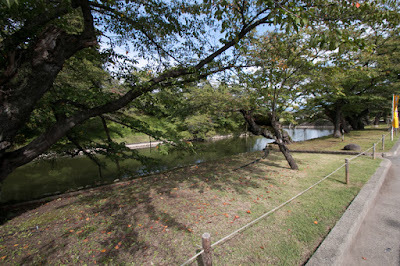 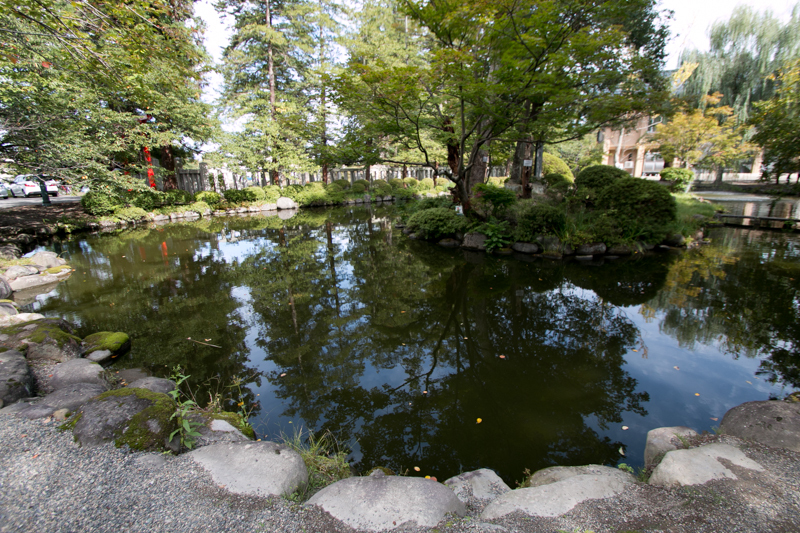 But central area and its water moat still well remain, and used as a ground of Uesugi shrine commemorating Kenshin Uesugi. 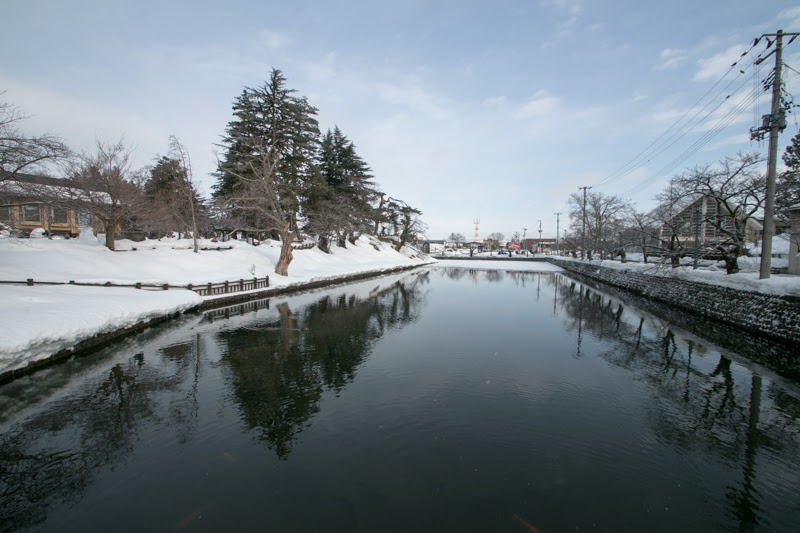 Simple exterior of Yonezawa castle consists of clay wall and water moat reflects spirit of simplicity and fortitude of Uesugi clan derived from Kenshin Uesugi, and also the reform of Yozan tried to decrease the burden to the residents. Instead of stone wall or building, many monuments and statues built in the castle tells importance of this castle and various stories of successive lords. 20 minutes walk from JR East Yamagata Shinkansen line Yonezawa station. 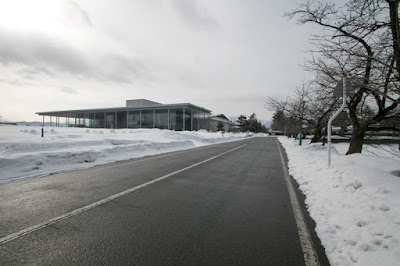 40 minutes drive from Tohoku Jidoshado Expressway Fukushima Iisaka interchange.